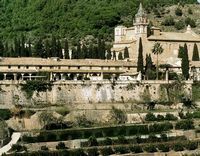 This monastery was founded in 1399 by the Carthusian monks, and inhabited by them until 1835, when they were expelled by the Spanish government. 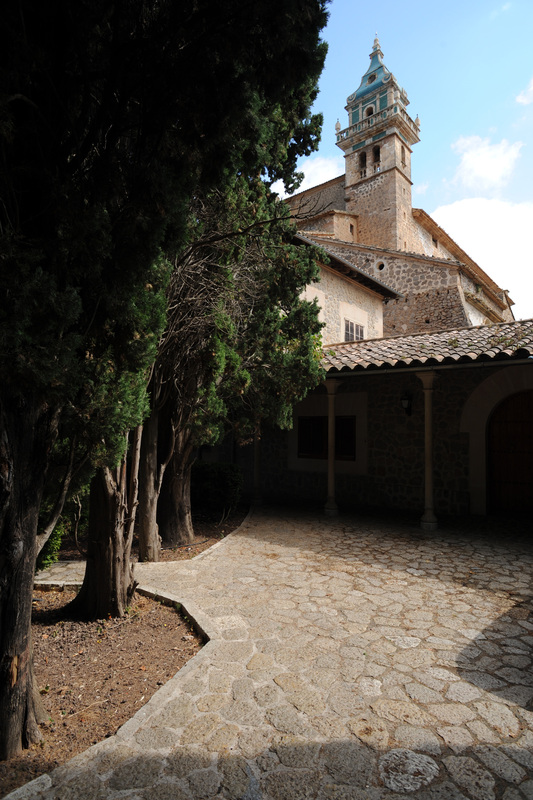 Since its secularization in the nineteenth century, the Monastery of Valldemossa has hosted many distinguished guests were the most famous Polish pianist and composer Frédéric Chopin and the French writer George Sand during the winter 1838-1839. 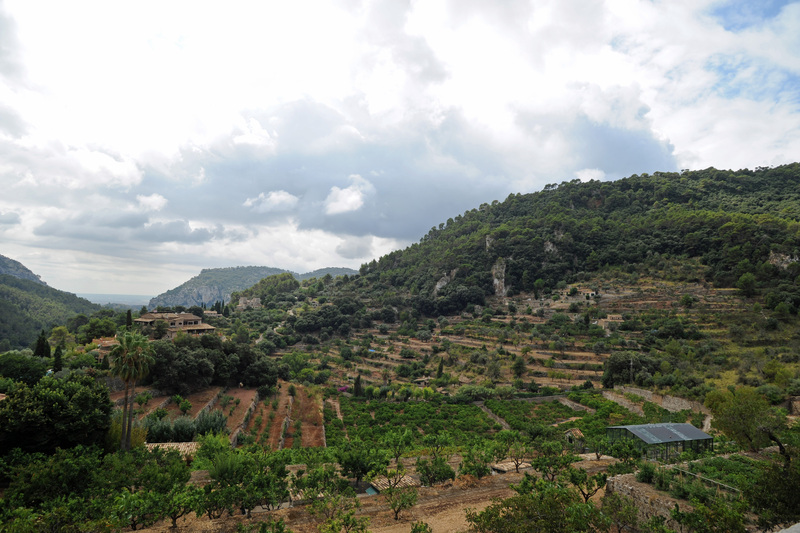 Chartreuse dominates the small town of Valldemossa at the foot of the Serra de Tramuntana in Mallorca. 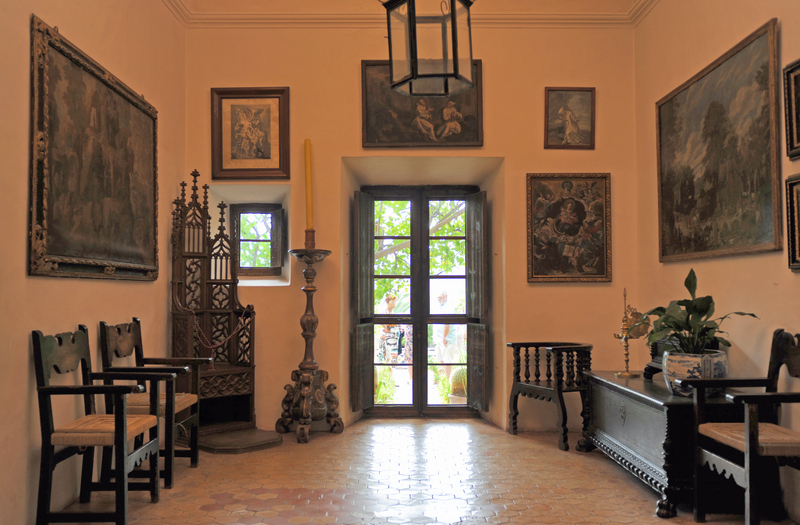 The museums of the Charterhouse of Valldemossa house the historical and artistic legacy of the Carthusians, manuscripts and memorabilia of the romantic couple of Frédéric Chopin and George Sand, and the testimony of the art and culture of the twentieth century. 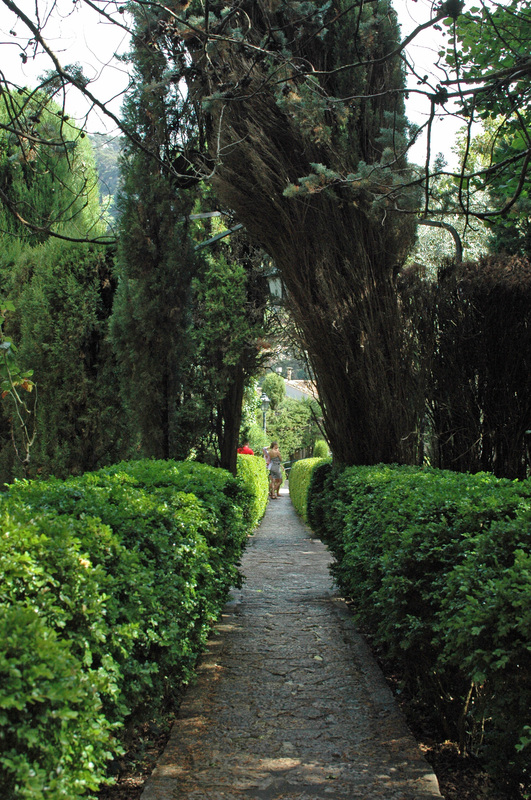 Most of the old monumental is currently open to visitors. The church of the Charterhouse of Valldemossa is a neoclassical style, its construction began in 1751 on the site of the first church built in 1446. 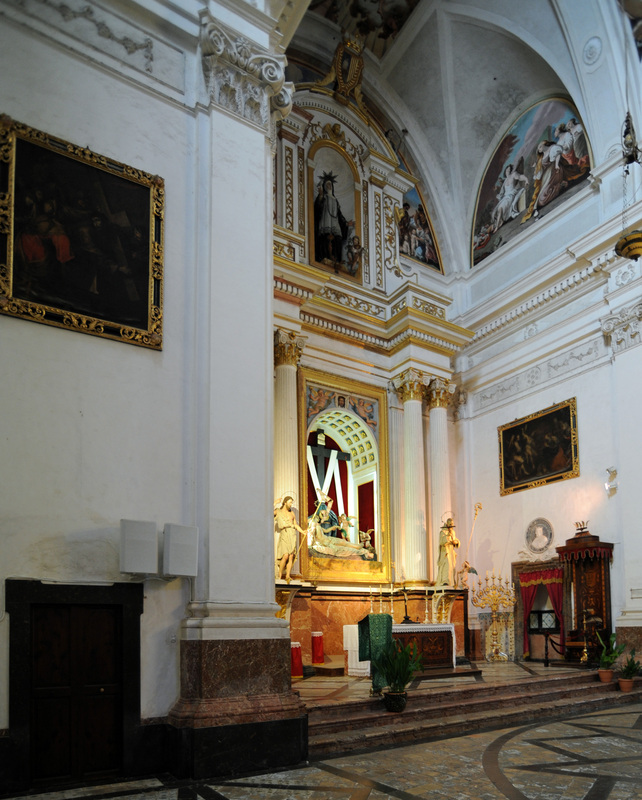 The abbey church was consecrated in 1812 and is still functioning. 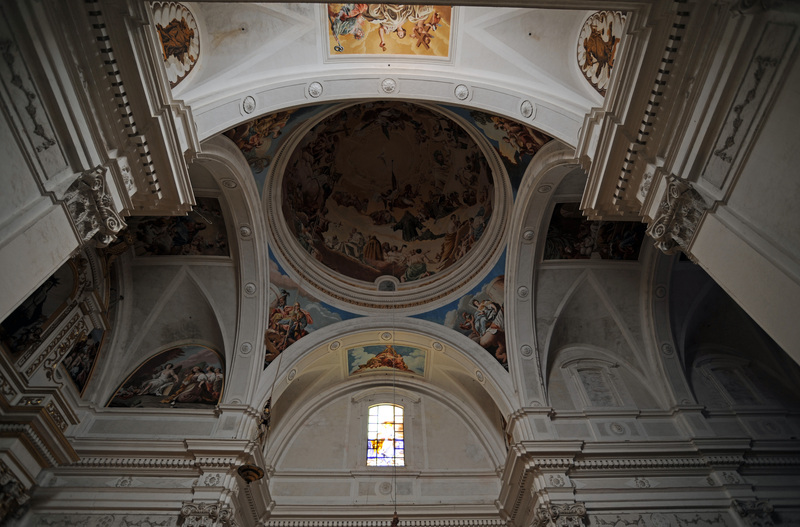 The church adopted a plan in the form of a Latin cross, with barrel vault and dome on intersecting ribs. 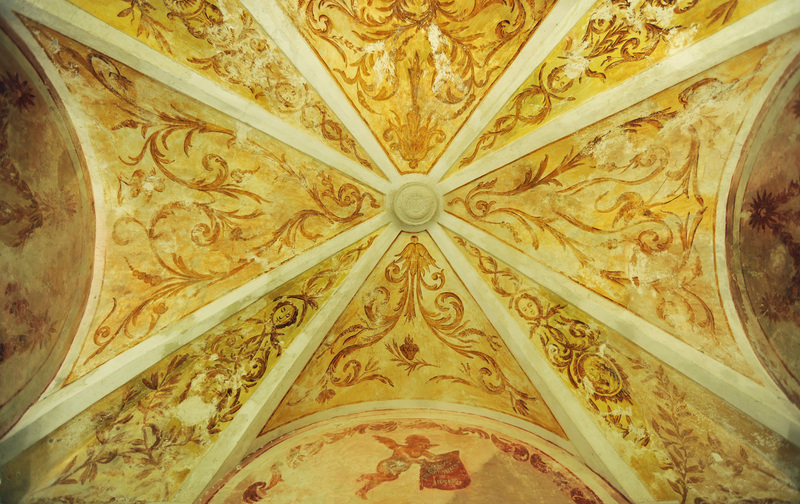 The interior is decorated with stucco and frescoes by Fray Manuel Bayeu, brother of Goya and Delacroix student of and paintings Fray Joaquín Juncosa. 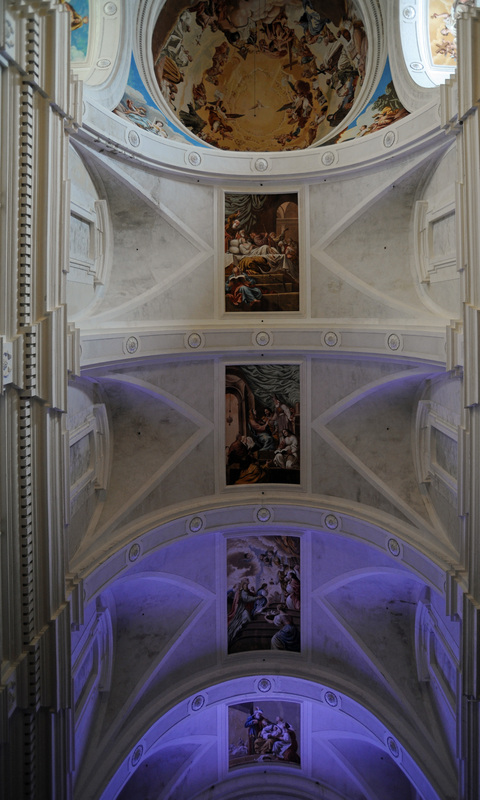 The artist Adriàn Ferràn is the author of the sculptures of St. Bruno and St. John the Baptist, who are currently in the chapel of the Blessed Sacrament Cathedral of Palma, and those that can be seen are true copies of the original Limés sculptor. 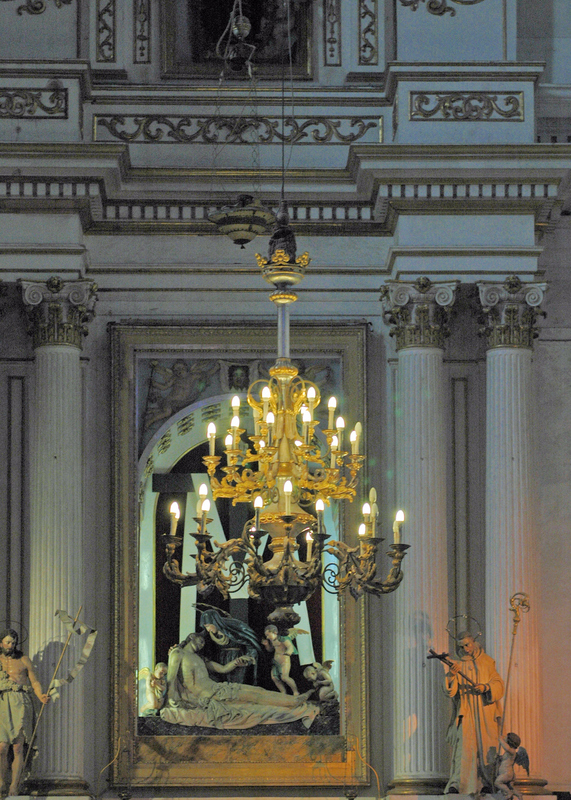 On the altar, a Mater Dolorosa with the body of Jesus and the cross downhill. 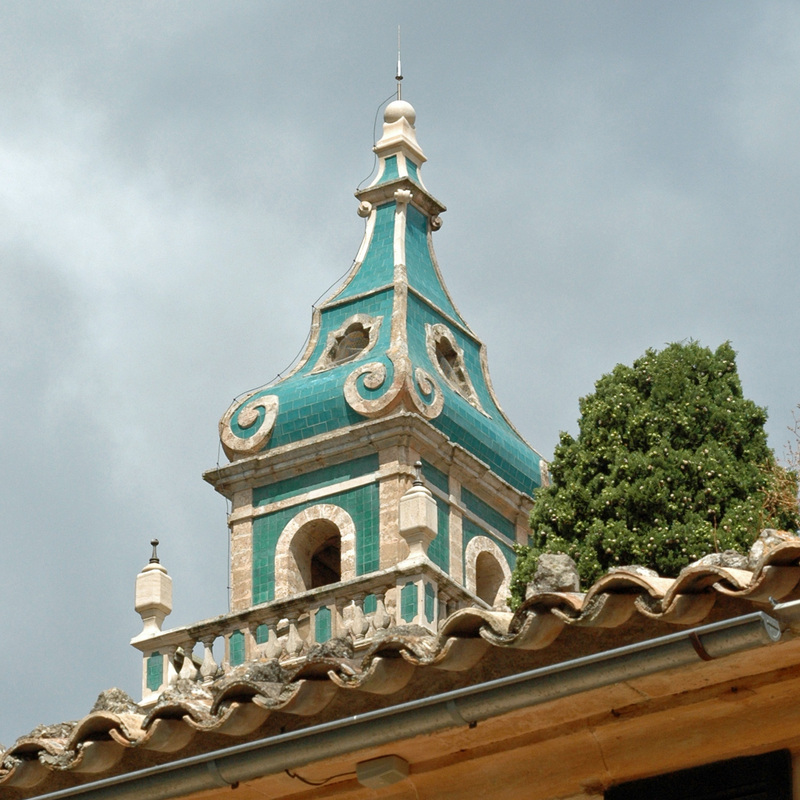 The whole is crowned by an image of "Santa Catalina Tomás" holy Valldemossa venerated by Carthusian monks. The choir stalls and the remains of tiles that made up at other times the great floor of the church are also of interest. 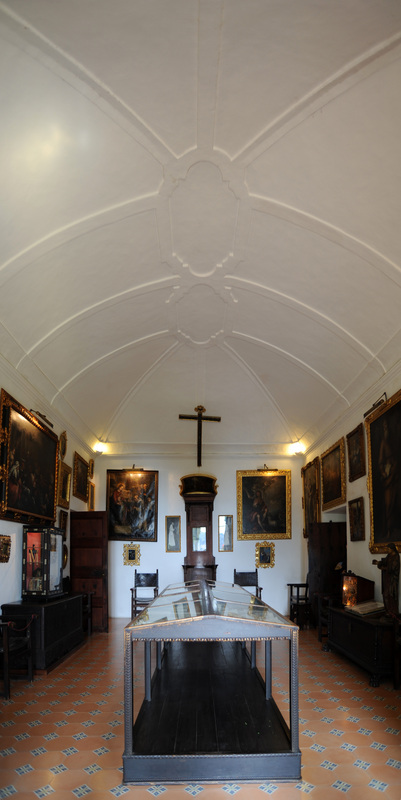 The sacristy also has very interesting cult objects, especially a desk and abbey seat, fine marquetry own in the early nineteenth century. 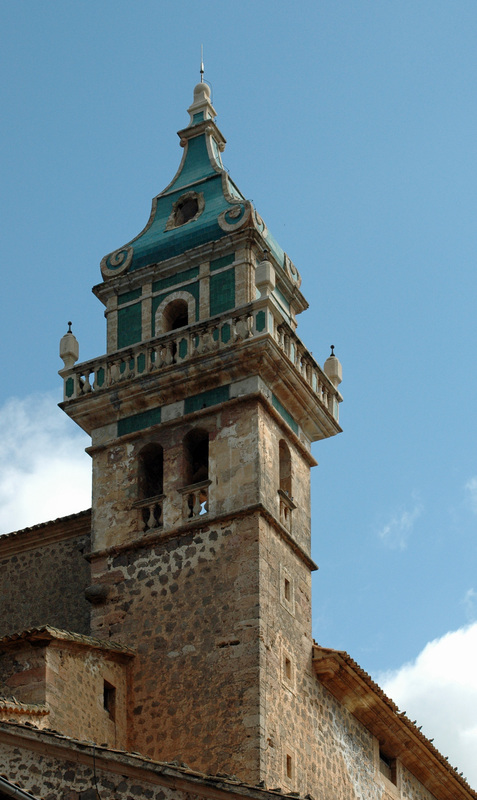 The twin tower of the church of the monastery, one of elegant towers is distinguished by its coating of green emerald tiles contrasting with its twin tower remained unfinished, is the silent witness of the expansion began in 1715 and abandoned after the expulsion of 1835. 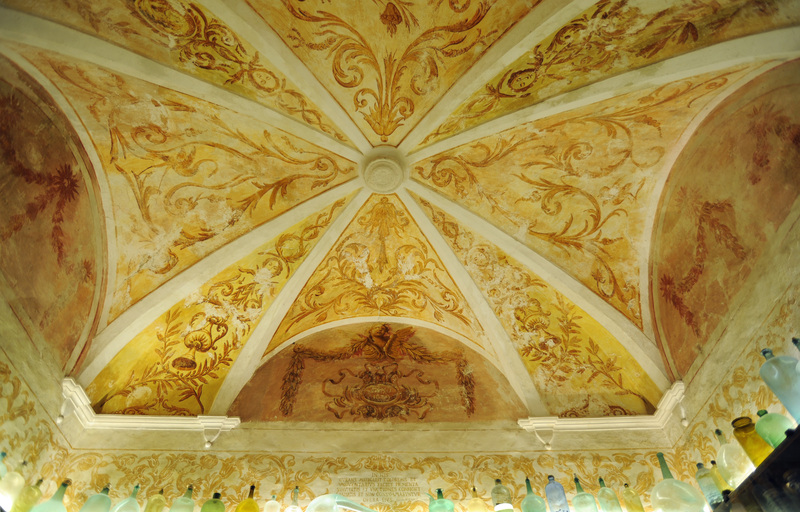 On leaving the church we meet first, left on one side of the cloister, the old pharmacy founded by the monks in the early eighteenth century, the third oldest pharmacy in Spain. 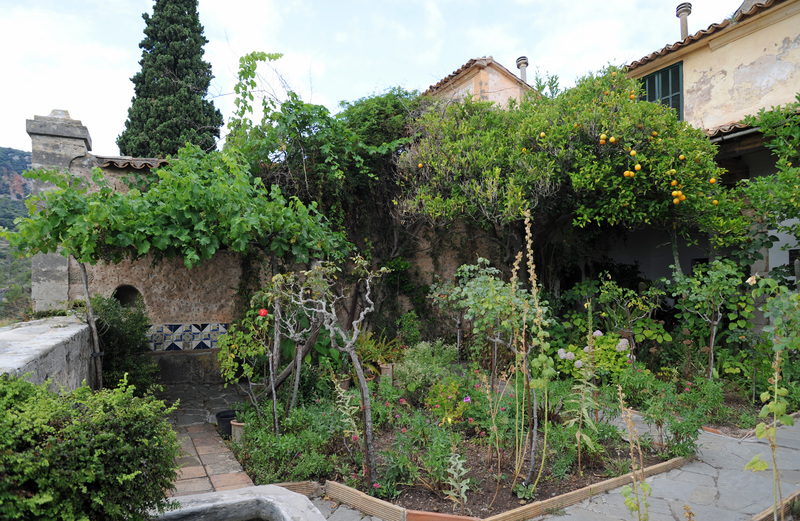 The Chartreux cultivated medicinal herbs in their little garden. 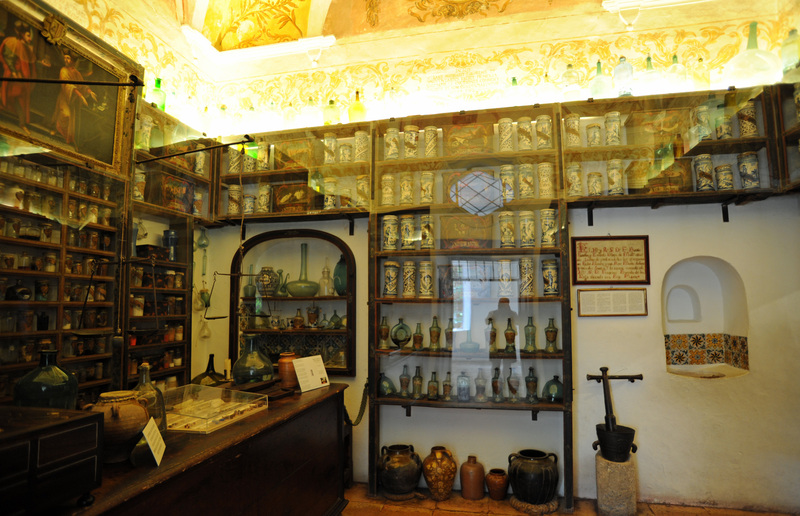 This beautiful pharmacy has been preserved as the oldest pharmacies that were at that time. 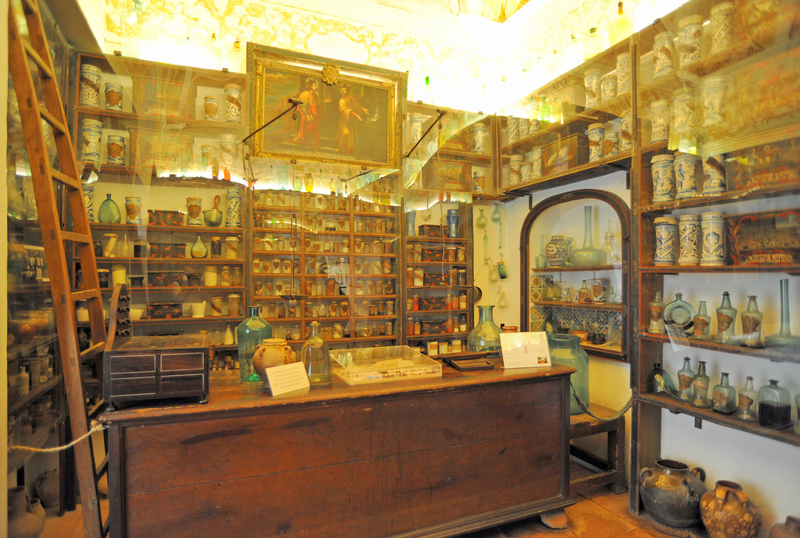 It has a fine collection of pots and jars filled with pharmacy drugs once, glass bottles, carboys and gourds, scales, mortars, pill boxes, boxes and so on. On the shelves, a collection of 135 ceramic pots Catalan (seventeenth and eighteenth centuries) with blue decoration with figures and plant and animal motifs. 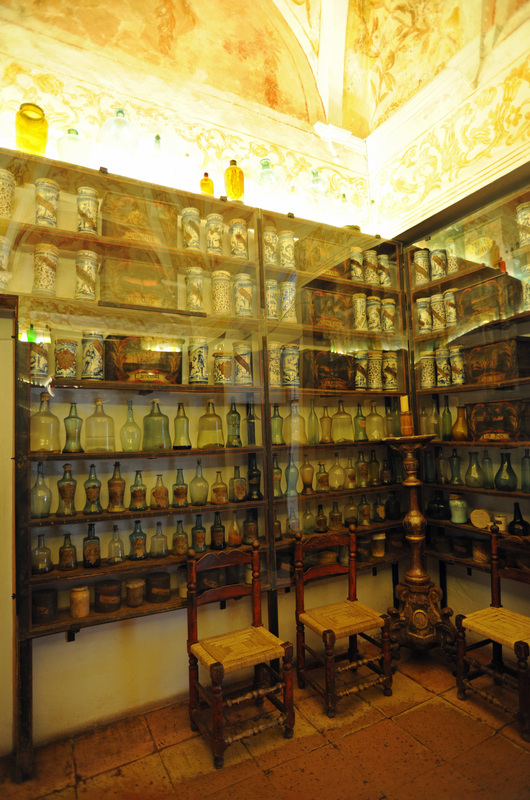 These containers had the dual function of containing solid drugs (ointments and extracts) to serve as ornaments in the shop. 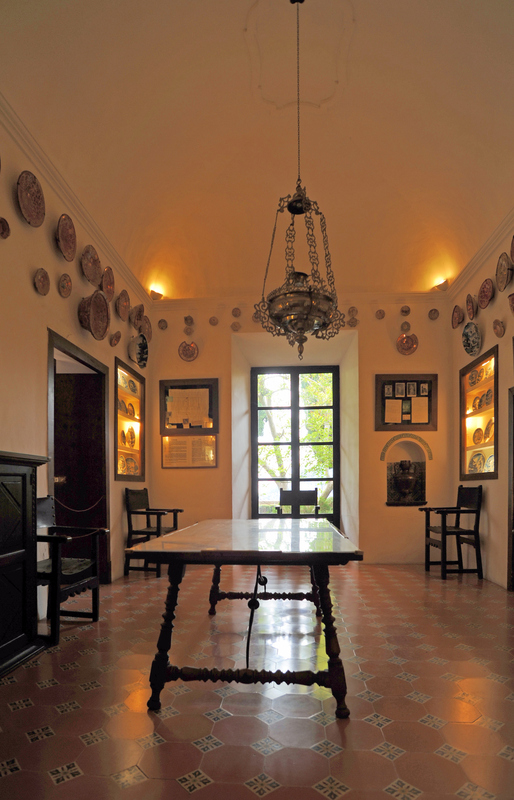 A collection of blown glass vessels, made ​​Mallorca, today still retain remnants of oils, syrups and potions. 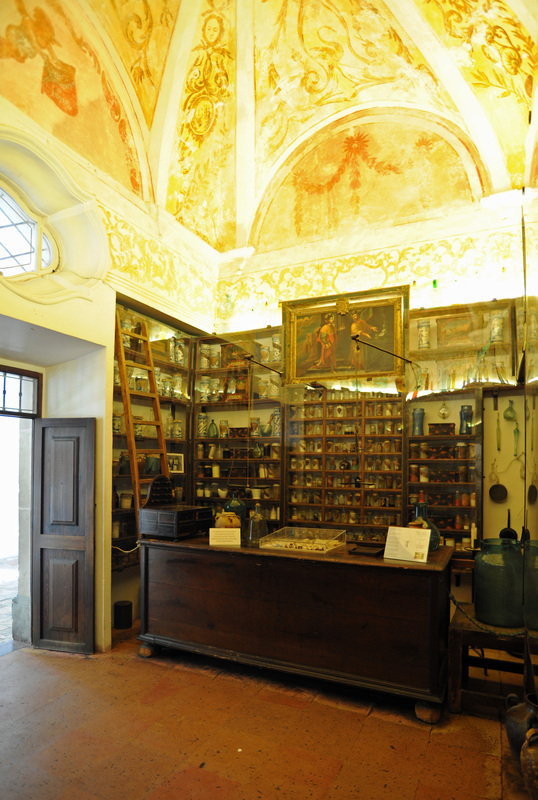 On the left wall, a painting of the holy physicians Cosmas and Damian chairs the pharmacy. 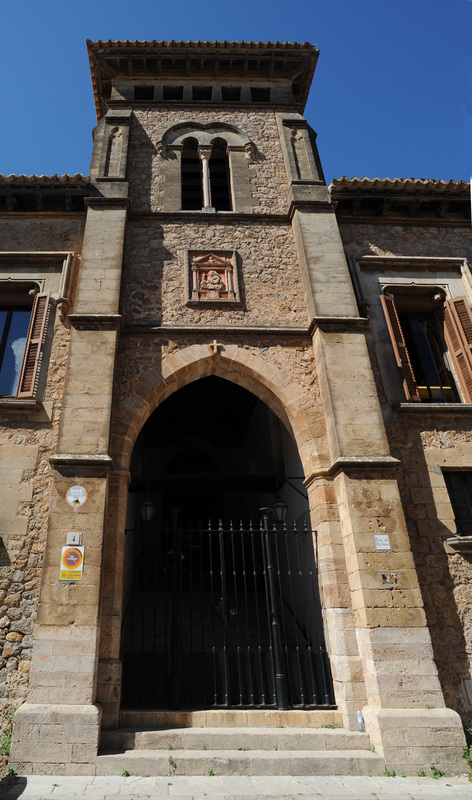 This pharmacy treated the pain of the religious community and, simultaneously, and long after, until 1896, those residents of Valldemossa. 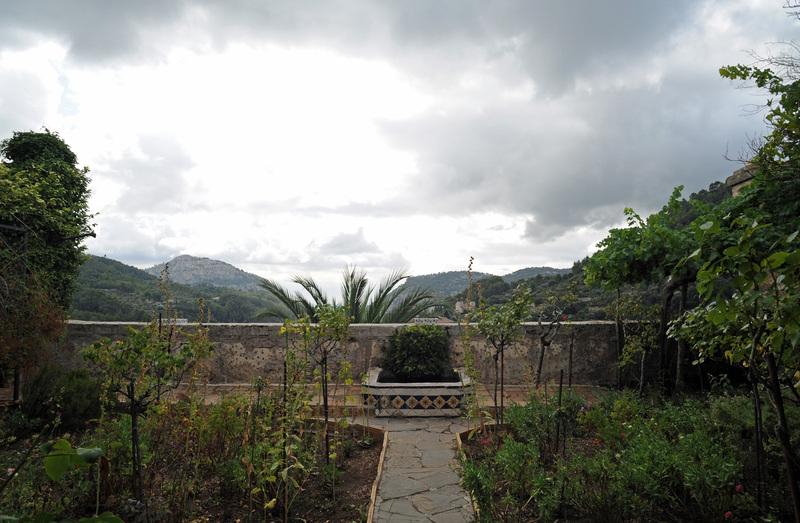 It is described by George Sand in his book "A Winter in Mallorca". 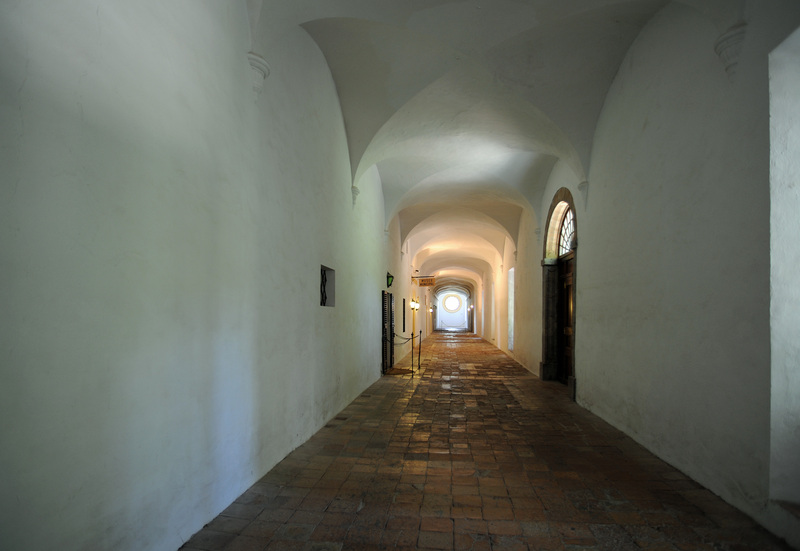 Exit on left, cross the cloister to move towards the cell of the Prior. 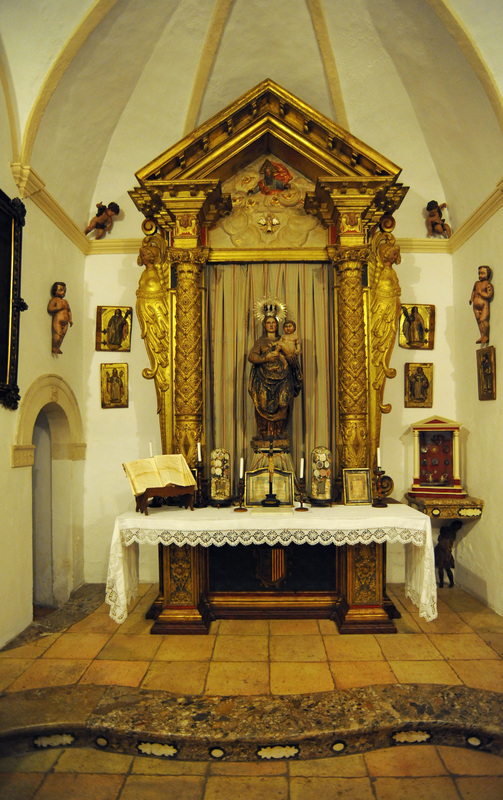 The Prior celebrated Mass in the little chapel that protects a harmonious image of the Virgin and the Infant Jesus, in Baroque style. 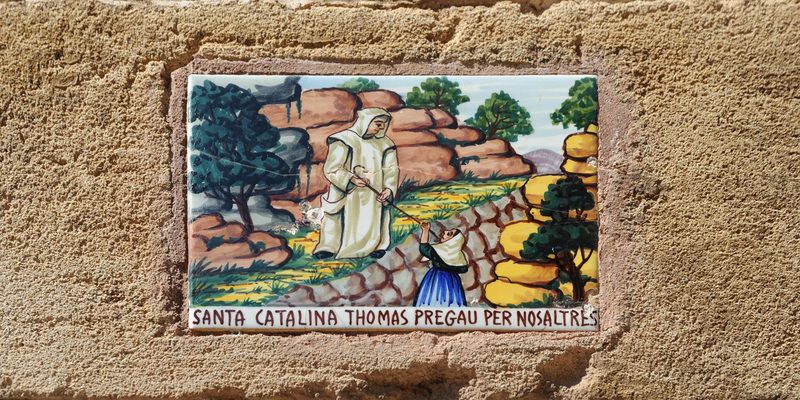 The chapel also has memories of "Santa Catalina Tomas". 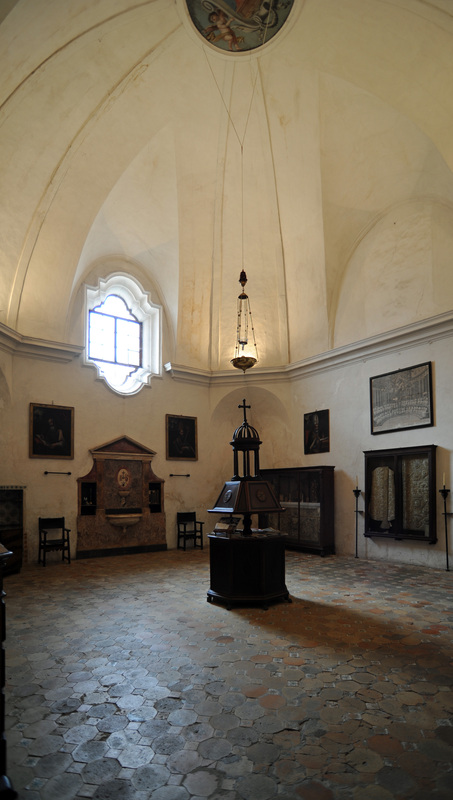 This is the cell inhabited the Prior, or Father Superior of the monastery. It is bigger than the others and this splendid ceramics. 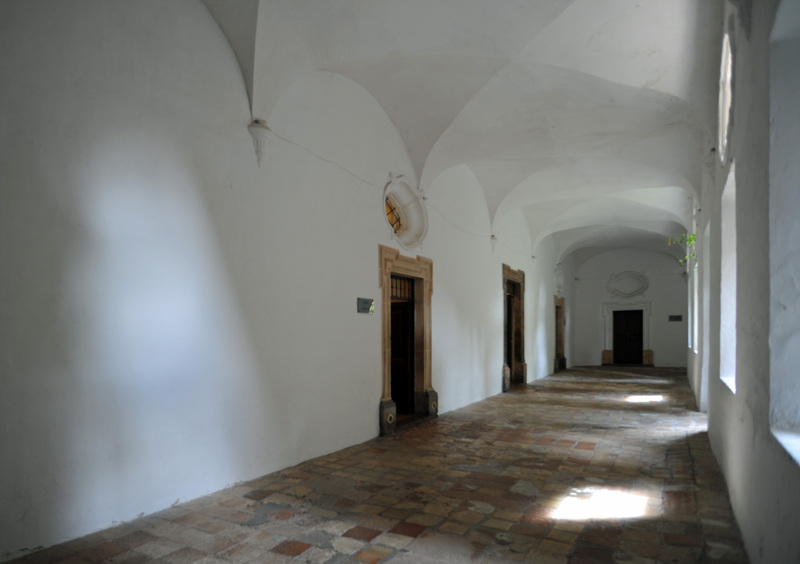 On the left is a list of priors Fathers who lived in this cell. 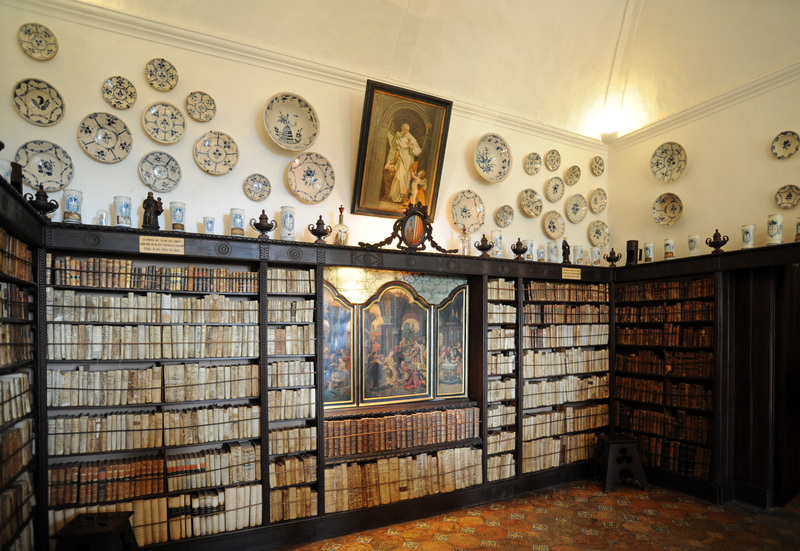 The library was the venue of the Carthusians at the weekly half-hour that their rules allow them to speak. It is here that met the Community, chaired by Father Prior, in order to discuss matters of general interest. According to tradition, they gathered Thursday afternoon for half an hour, one of the few opportunities available to them during the week, according to the rules of the Order, to speak them. 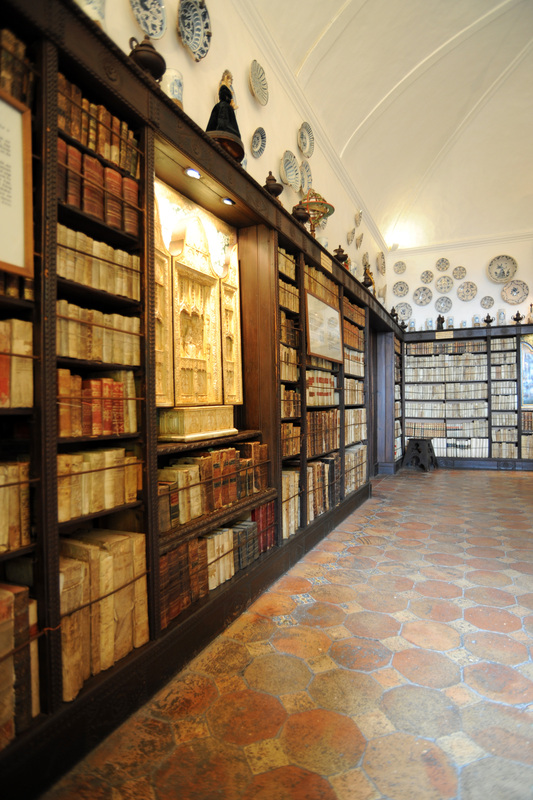 The library collects books and manuscripts of the Carthusians. 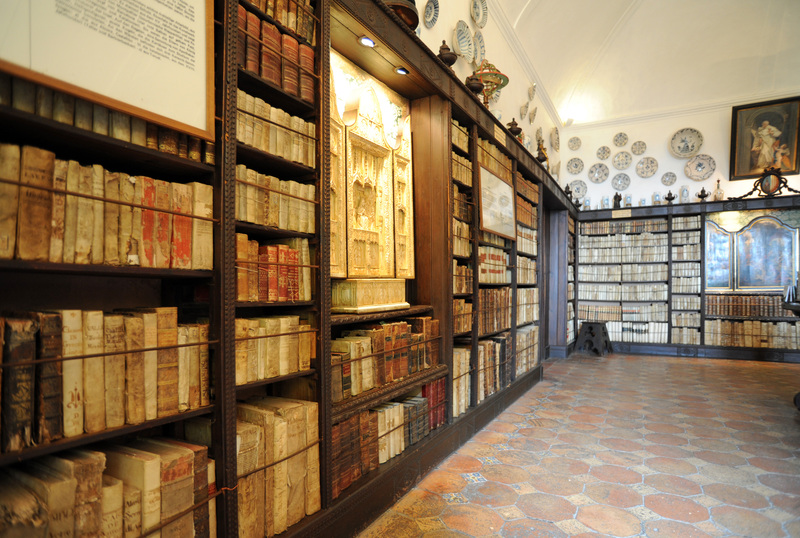 Each monk could take up to three books to take to his cell. 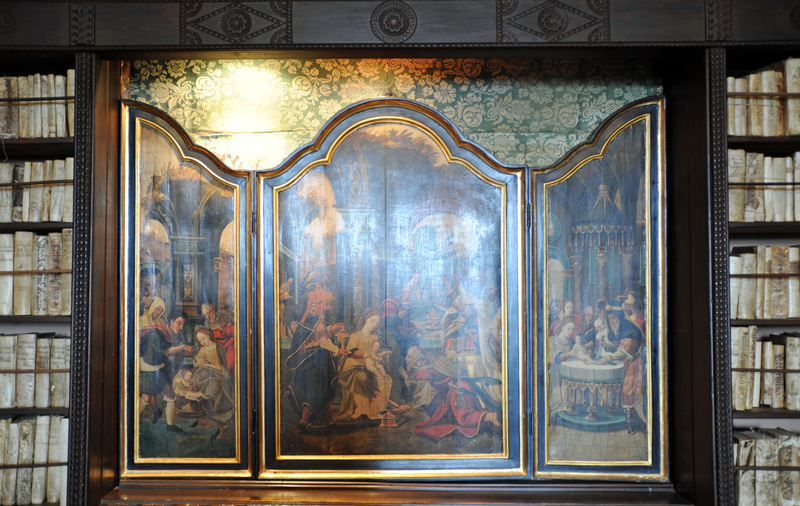 Notice a great triptych, a Flemish painter of the sixteenth century, another ivory fifteenth century which represents the marriage of Marie de Montpellier (lily) with Pedro II de Aragon, Count of Barcelona (Catalan bars) father of King Jaume I, the Conqueror of Mallorca. 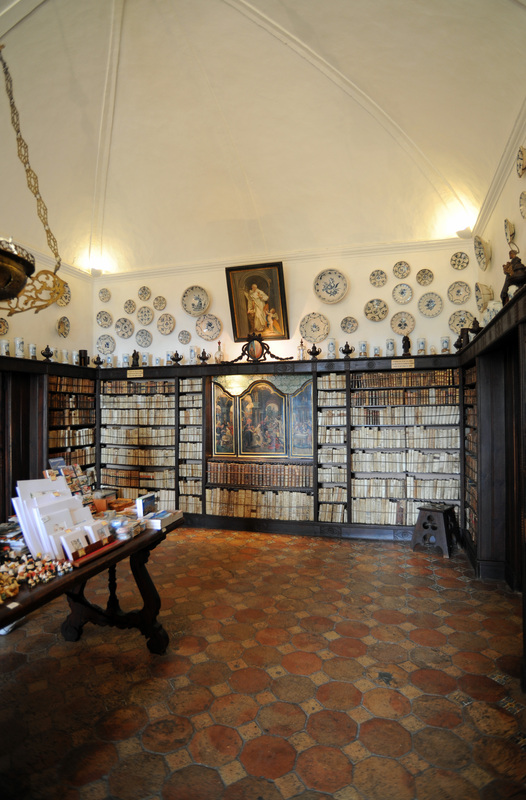 On the shelves, collections of pharmacy jars, statuettes of saints, armillary spheres that Chartreux used in their studies of astronomy. In the hall of the Prior Hearings received visits, which were to be many that this Order received extensive property of royal gifts from individuals and other organizations, which meant constant contact with officials, administrators, sharecroppers, et cetera. 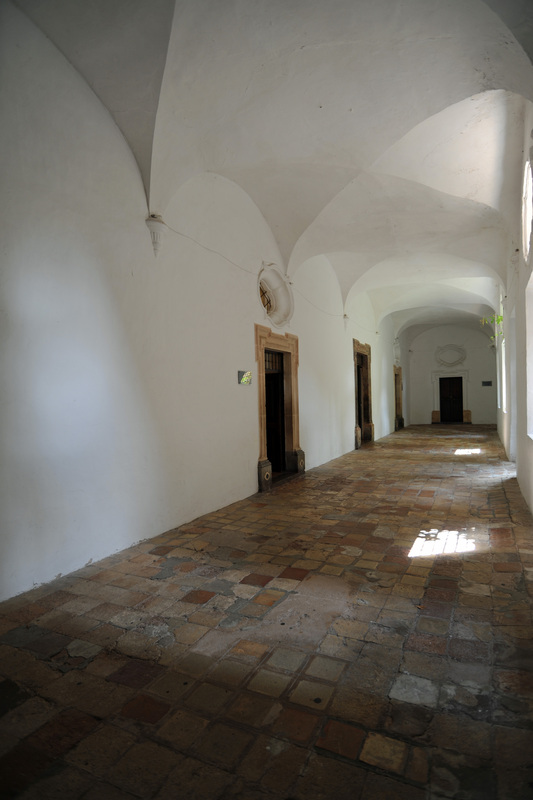 At the end of the hall is the seat of the Prior. a royal letter of Philip IV granting the tax exemption of the monastery property. 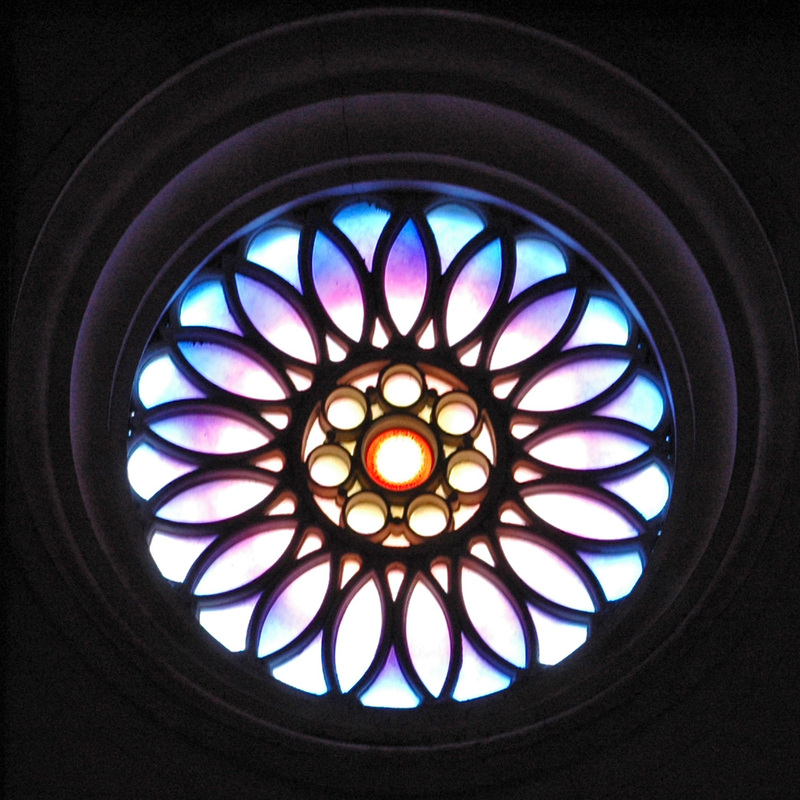 In the window, a draft of the sculptural group "Piety" the altarpiece of the church. Jacopo Bassano one representing the "Flight of the Israelites from Egypt"
a small oil painting workshop El Greco. 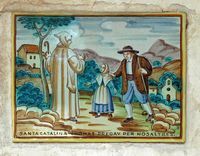 On the bridge, a "Saint Bruno", founder of the Carthusian Order, whose headquarters is at the Grande Chartreuse near Grenoble, (where we make the famous Carthusian liquor). 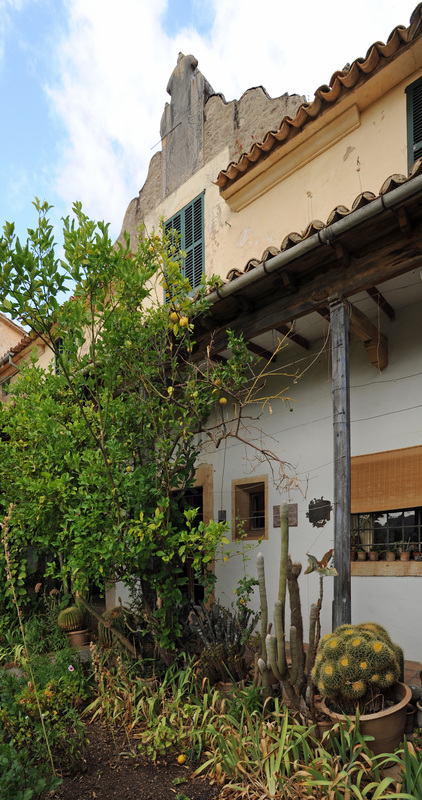 The furniture is Majorcan style. In the garden of the Prior, two magnolias in February, are of exotic flowers with white and purple shades. 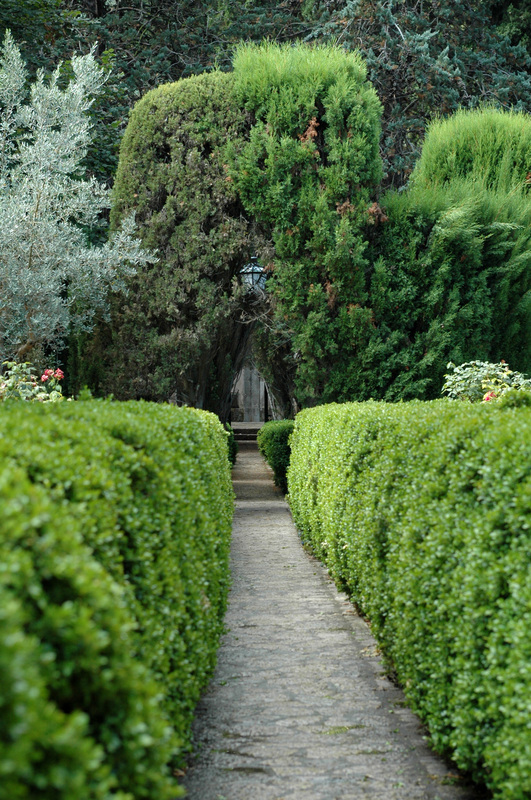 The garden of the Prior is a beautiful view of the surrounding countryside. 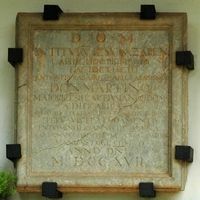 On the wall is an inscription that refers to the laying of the first stone of the new monastery in the eighteenth century. DOM (God, infinitely Good, infinitely Great). To Jesus of Nazareth this stone cut and posed since the ancient time of 1399 is dedicated, being king of Aragon Don Martín. 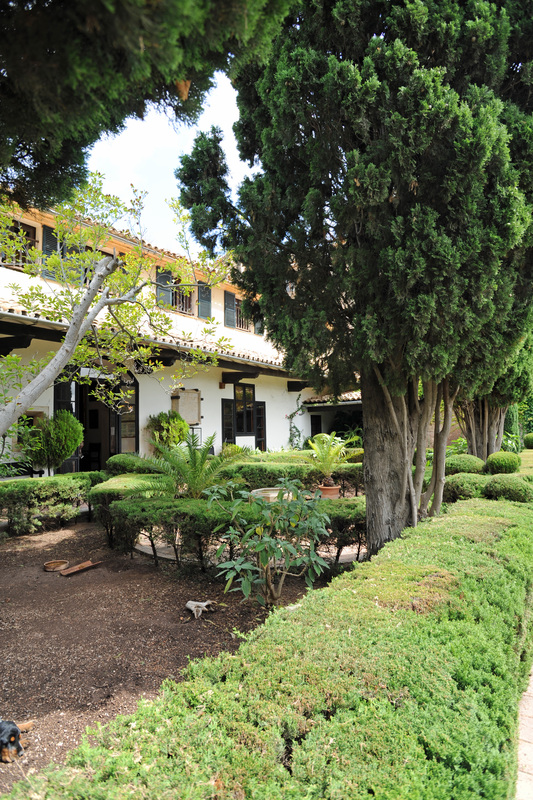 This Majorcan house of Carthusian started to be built under the pontificate of Clement XI and the reign of Philip V flashes back of his foundations with this first stone posed by the hands of Its Excellency Don Juan de Acuña, Marquis of Casafuerte and the governor of the Balearic Islands, in the year of the Lord 1717. 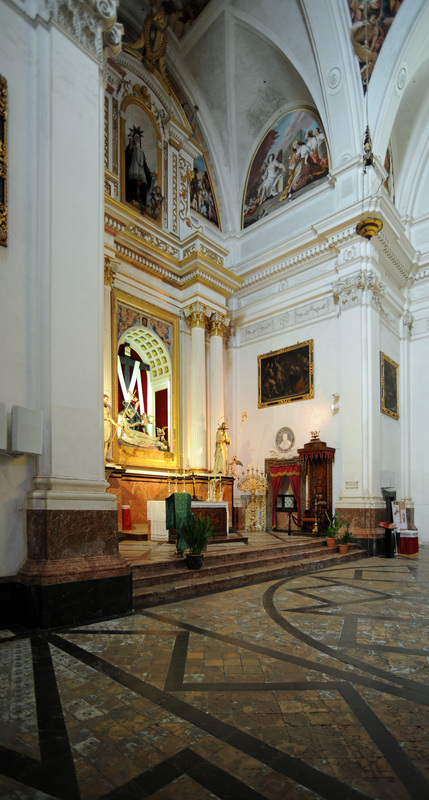 Dated November 26, 1717, as Prior of the Chartreuse of Jesus of Nazareth, Father Don Dionisio Fábregues and after celebrating a solemn mass sung by the master of classical music of the Cathedral of Mallorca, the faithful walked in procession to place for the laying of the first stone of the new building. This stone was located in the lower part of the support wall of the garden of the Prior of the cell. 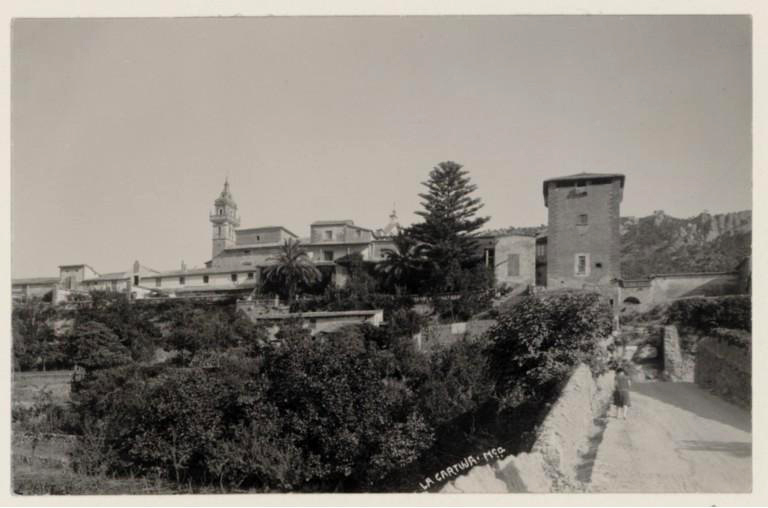 On 26 May 1970 it was moved to this place with the intervention of the Directorate General of Fine Arts and the Mayor of the City. 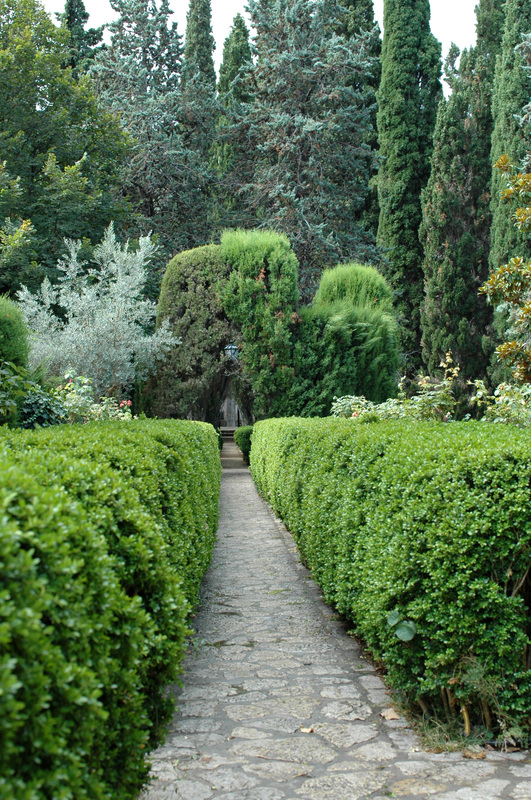 Continuing through the garden of the Prior is reached the room, which has a mannequin dressed as monks. The tower allowed to demand the necessary bread was kept. 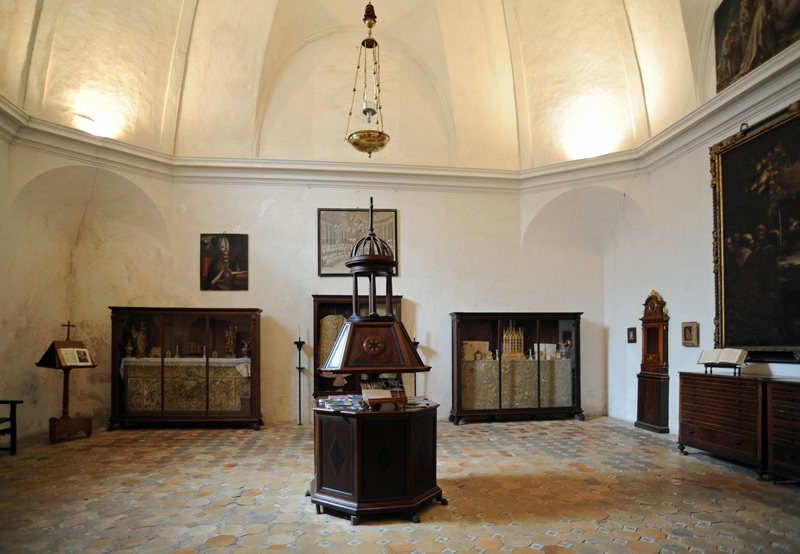 In the window, objects of the Carthusians, including an interesting clock, lamp oil, sackcloth, disciplines for penitential mortification and a schedule of the monks. The Chartreux eat alone in their cells. Their diet consisted mainly of green vegetables, dairy products and fish, accompanied by bread and wine with water. They could never eat meat. In case of illness, they could make turtle soup, protein rich year. 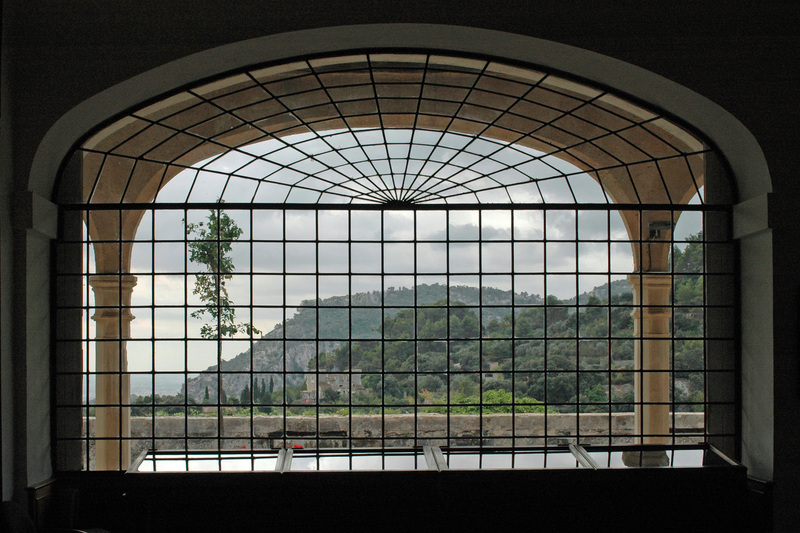 Meals were served by windows that opened onto the corridor. They practiced long fasts throughout the year, and on some occasions, were limited to one meal per day. 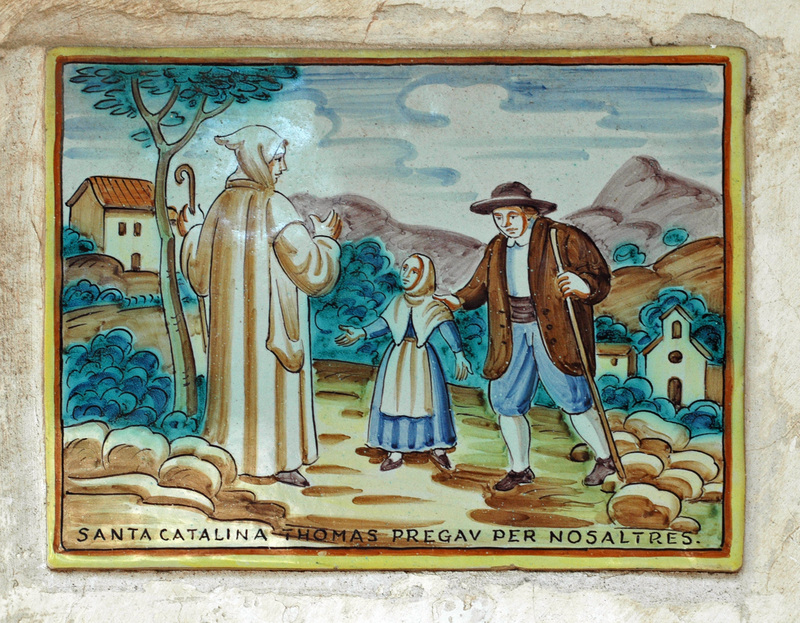 This strict and healthy diet, longevity of the Carthusian monks became proverbial. 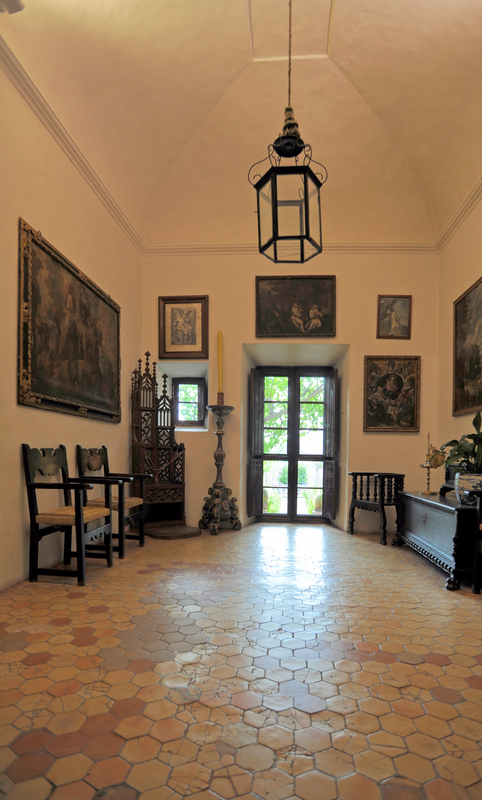 The dining room was at the disposal of illustrious visitors were received in the Hall of Audiences. These, because of the rudimentary means of communication at the time, had to extend their stay in the monastery, where in this case, a meal was served. 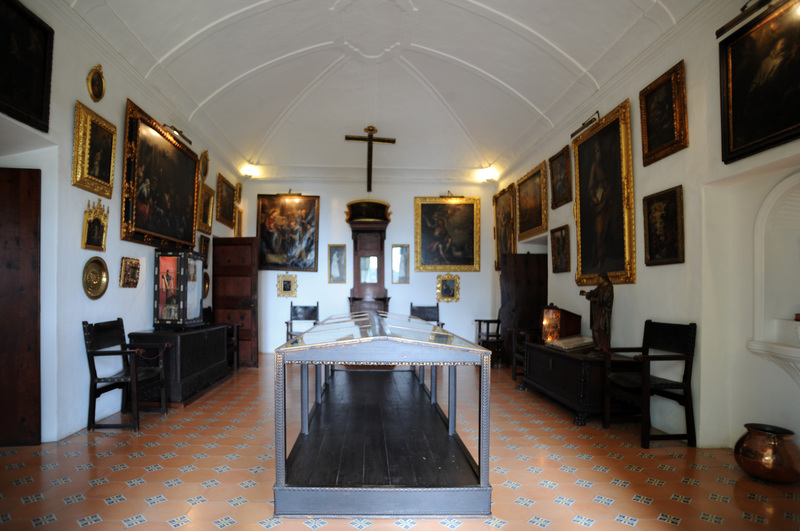 On the table and under the glass, documents relating to the history of this place, the map of the Carthusian built in 1785, with edited by Carthusian Monastery photographs that exist in Spain. On the walls, another card with current Chartreuses and valuable collections of Spanish-Arabic dishes with metallic reflections. 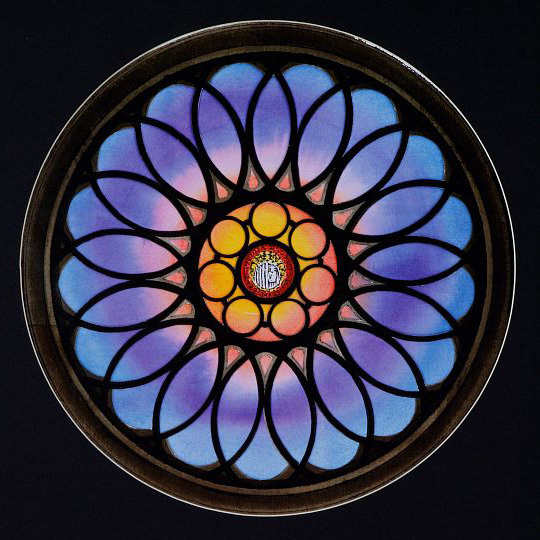 In the windows, ceramics Savona (Arbisola, Genoa) and Catalan fifteenth and eighteenth centuries, polychrome roses. 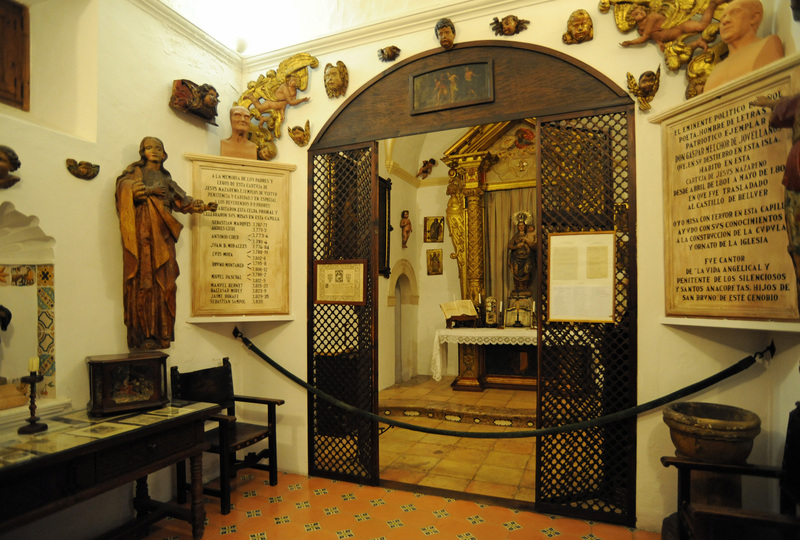 Two documents preserved: left, the schedule of the donation by King Martin I of the Real Alcázar de Valldemosa the Carthusians, and, right, the bill sculptor Adriàn Ferràn he carved for the Saints in the Church. 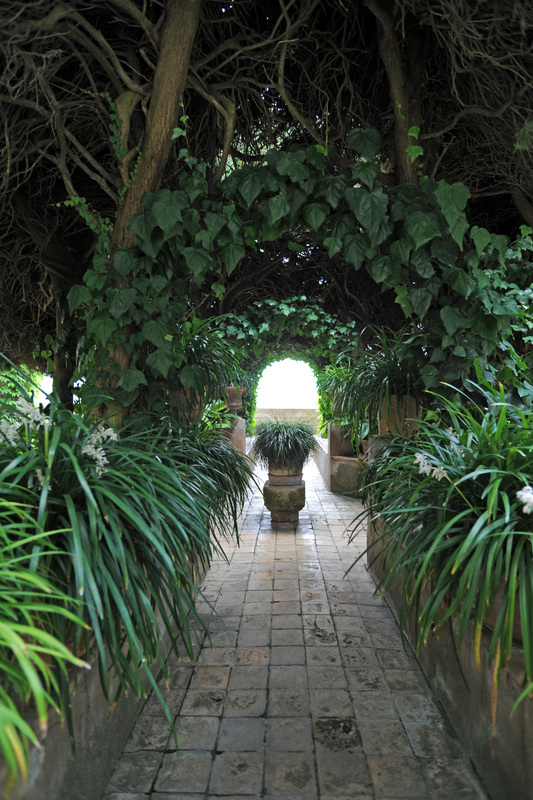 Coming out in the corridor, through the small vestibule, you can admire a "divine shepherdess". 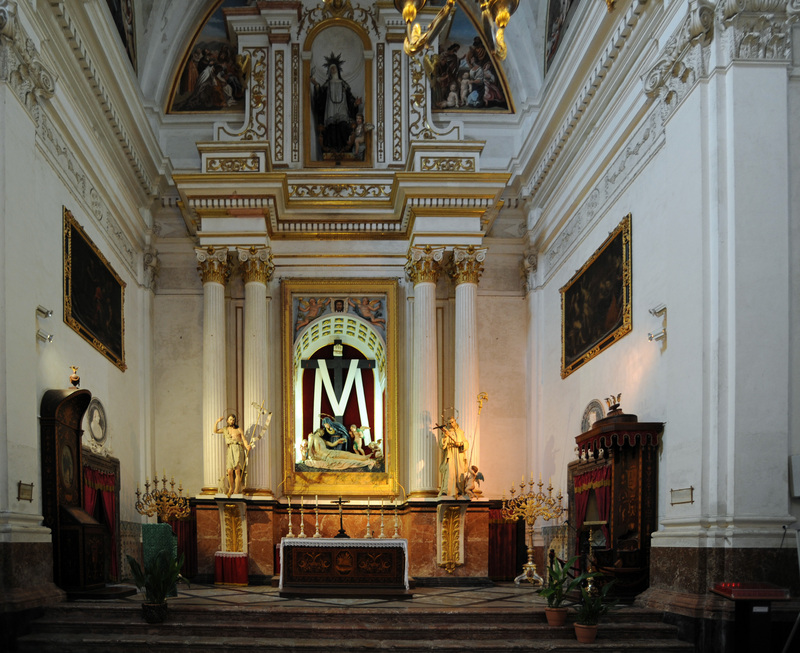 These lobbies that exist in all cells are called "Ave Maria" because of the custom of monks kneel and pray a Hail Mary every time they entered their cell. 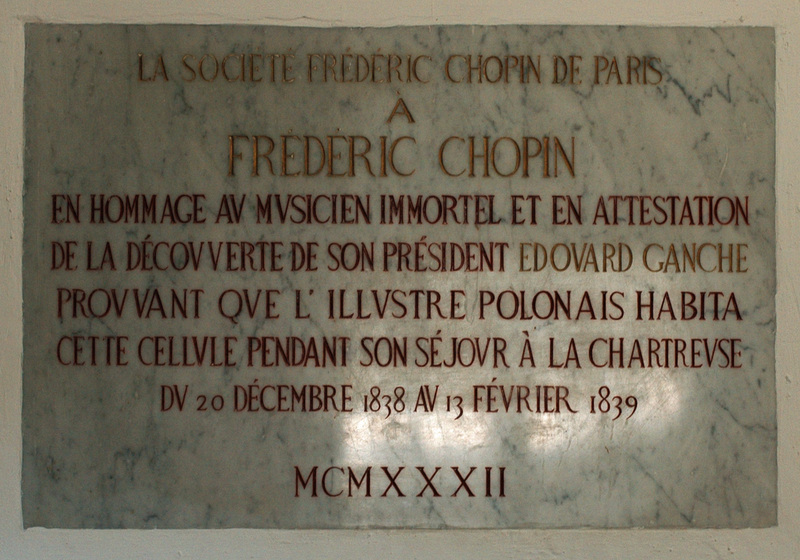 In this corridor, the second door on the left is that of the cell number 2, one of the cells occupied What Frédéric Chopin and George Sand. 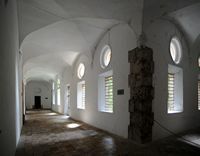 After the theft of the Carthusian monastery in 1835, the cells were sold to individuals who rented to visitors. 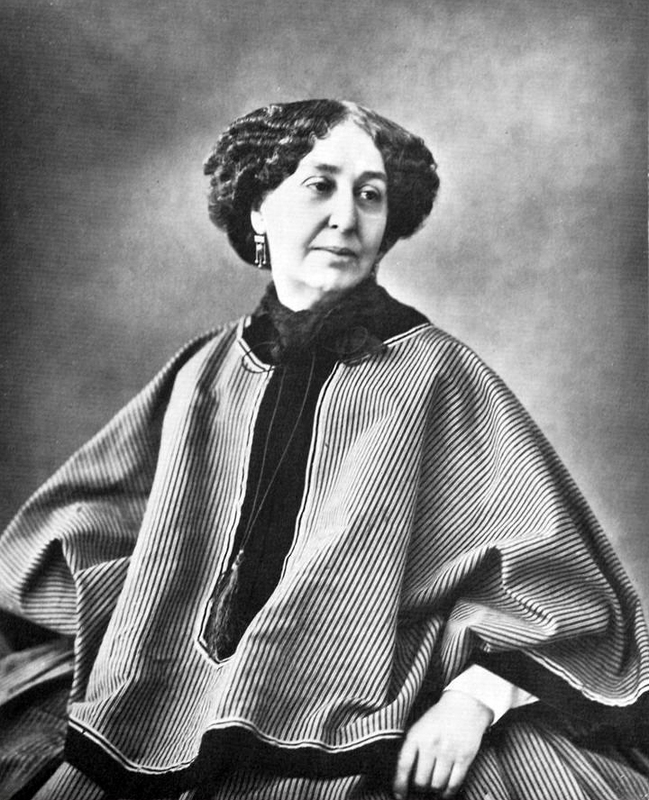 Thus the French writer George Sand and her lover, the Polish composer Frédéric Chopin, hired two cells during the winter 1838. 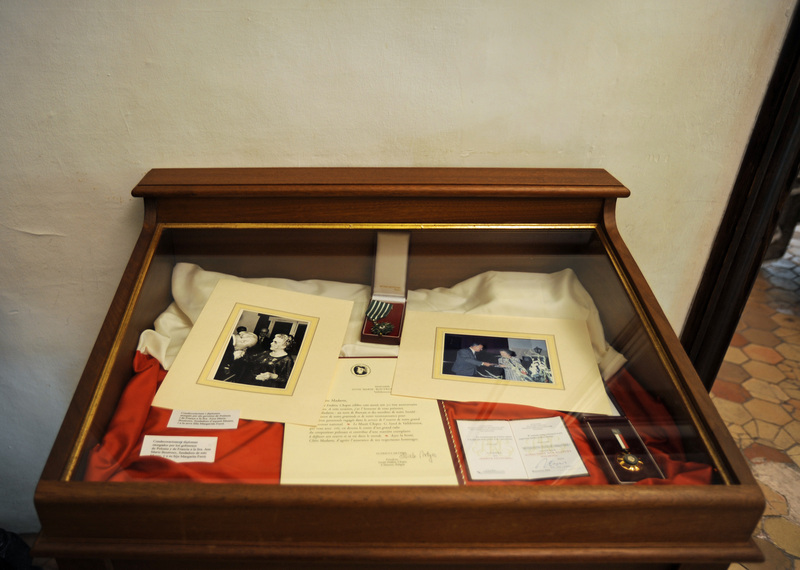 In cells 2 and 4, letters, original scores and other personal items remind the distinguished visitors. 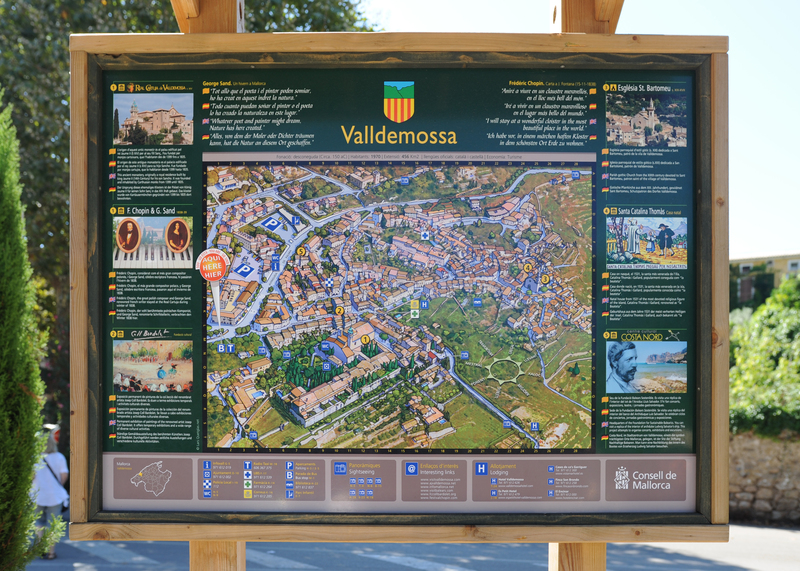 This will apply to the small town of Valldemossa its popularity: despite the short stay of two celebrities, more than 100,000 tourists annually visit the places where Chopin and Sand lived. 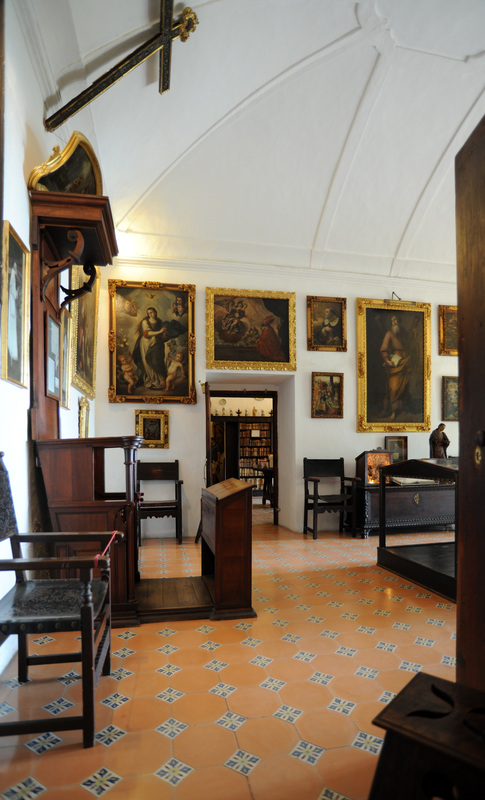 The main room is decorated with furniture and paintings of the Carthusians. "My cell shaped like a large coffin has a huge dusty vault. Facing the window (…) a cot. " 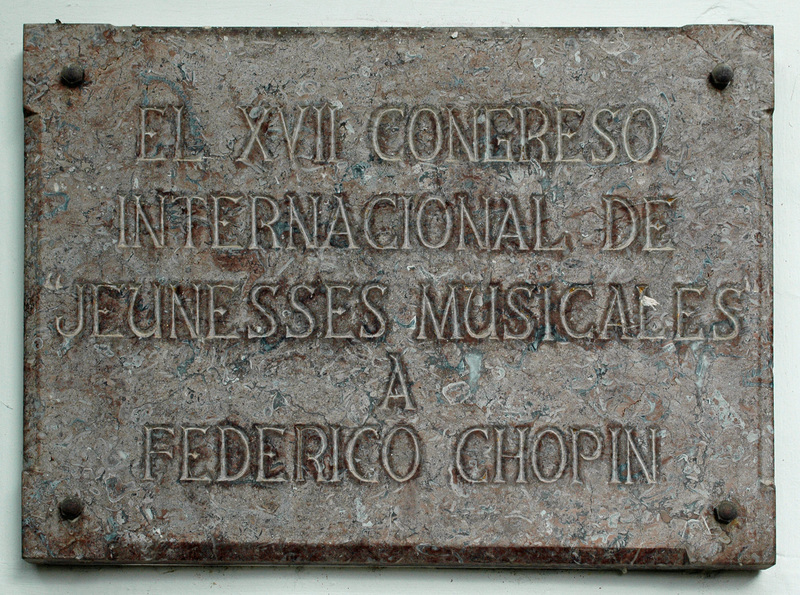 "Chopin played on a poor Majorcan piano." 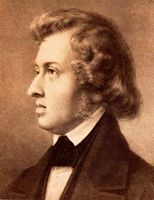 Chopin on the piano composed one of his most iconic works: the prelude entitled "Water Drop". In the window, a collection of original autograph scores of Frédéric Chopin, including the Research and Nocturnes, and some personal memories of musician ivory comb, lock of hair and jewelry box. 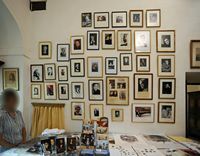 Decorations and diplomas awarded by the governments of Poland and France to the Chopin Society in Warsaw and other entities. In the window on the table, an album containing 114 drawings and watercolors by Maurice Sand, the son of the writer. 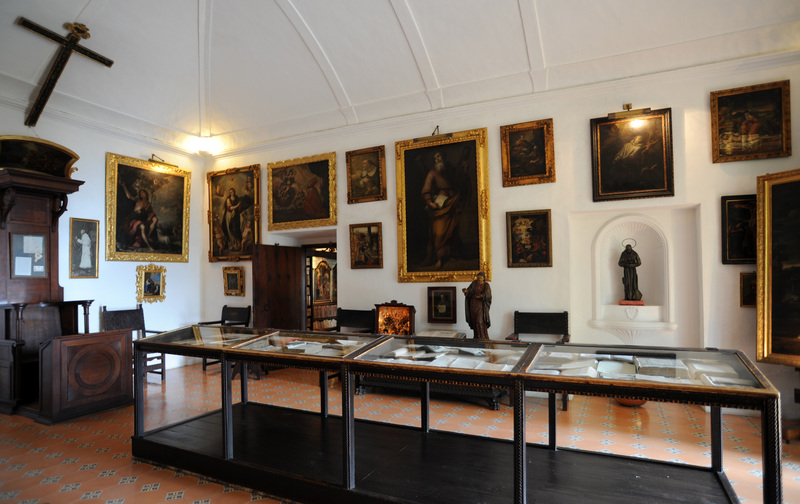 Are also exposed the original portraits of Delacroix, Scheffer, Kwiatkowski, et cetera. 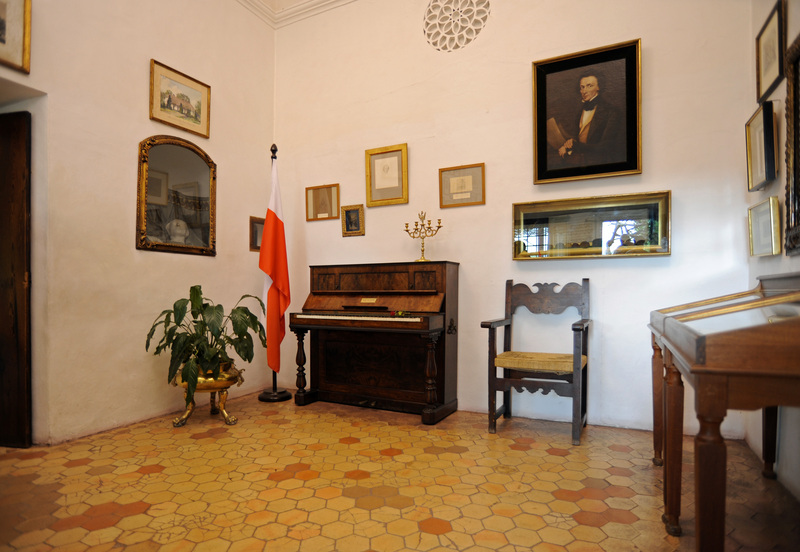 Headquarters of the International Chopin Festival (in the cloister in August), the cell receives world-renowned pianists. the autograph manuscript of his story "A Winter in Mallorca" where she recounts her trip and stay with her ​​children and Frédéric Chopin (1838-1839). 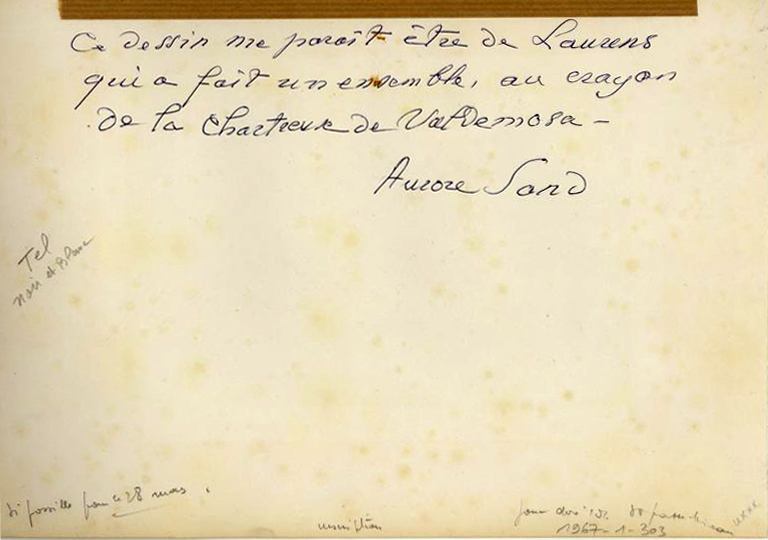 Three editions of this story, published in 1841, 1842 and 1855.
a collection of autograph letters of George Sand for their stay at the Chartreuse. 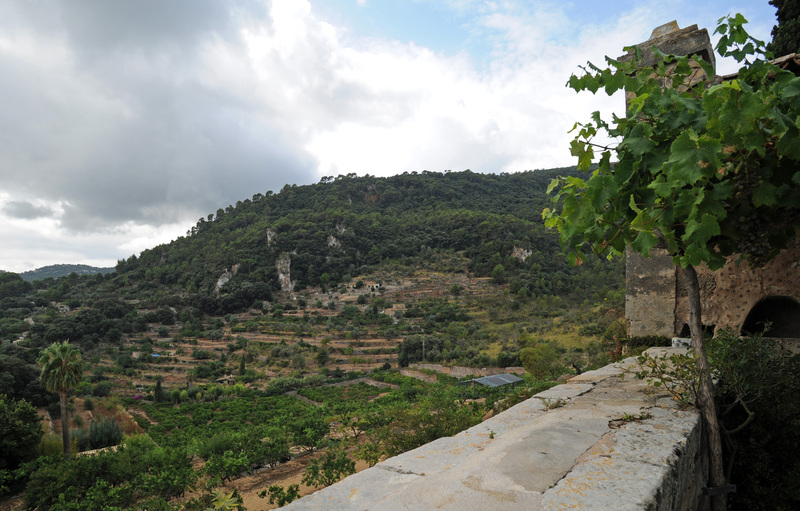 a peasant couple, bought by George Sand, first memory of tourism Mallorca. 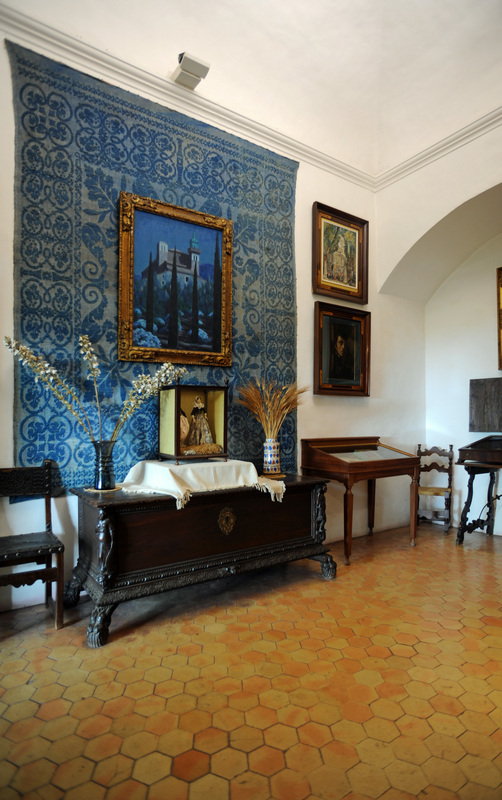 portraits of George Sand, original Dubufe and Nadar, "Chartreuse", an oil painting of Bartomeu Ferré, founder of the museum with Anne Boutroux. 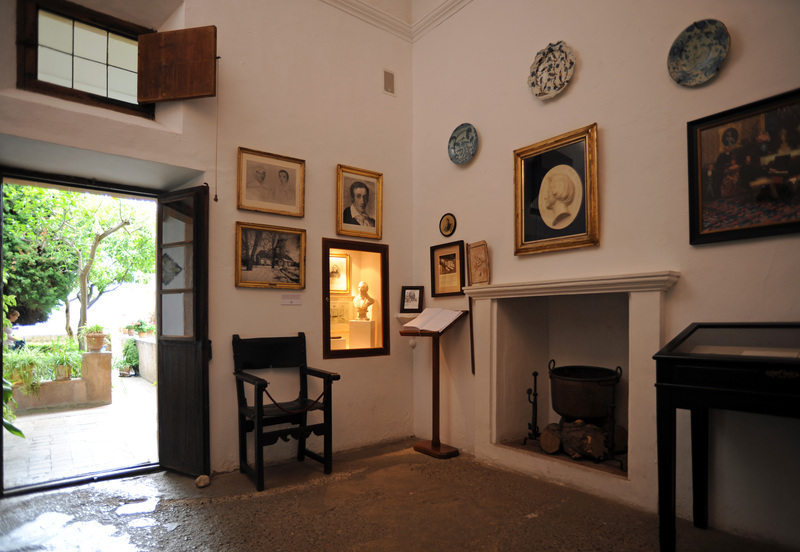 It is here that George Sand wrote his "Spyridon". 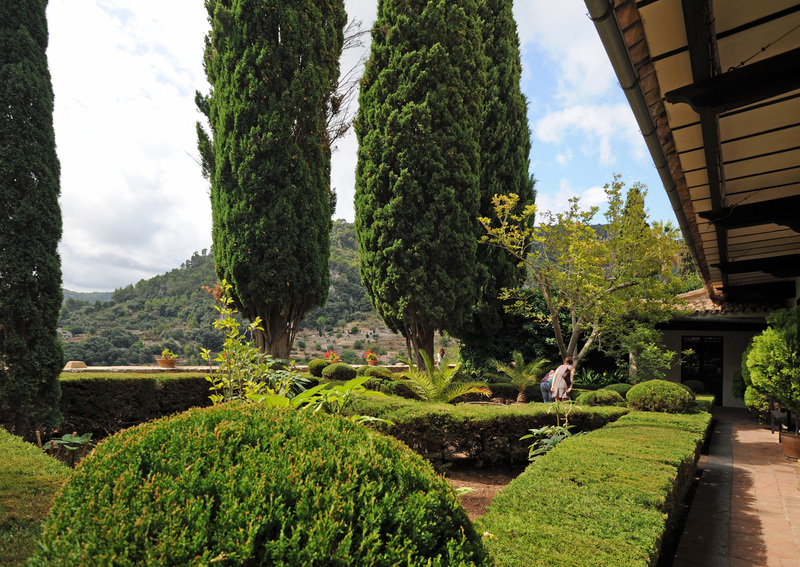 The monks’ cells have a beautiful view of the gardens. 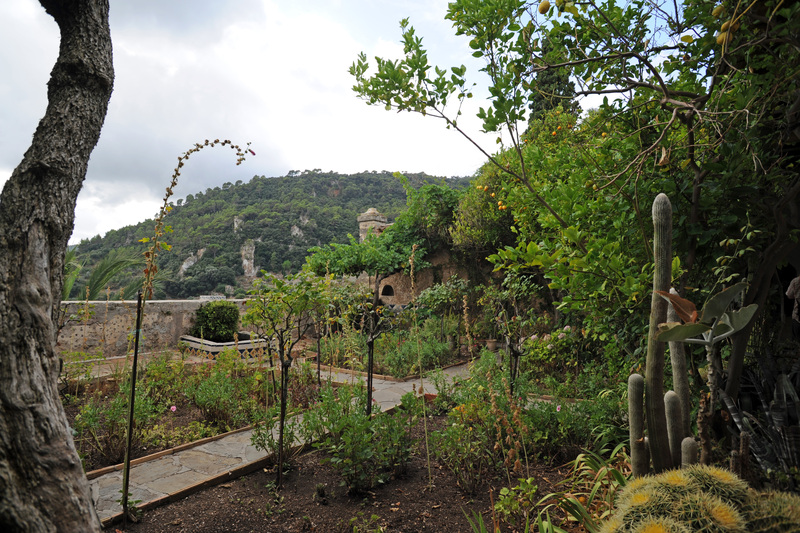 The garden was laid out according to the drawings of Maurice Sand. 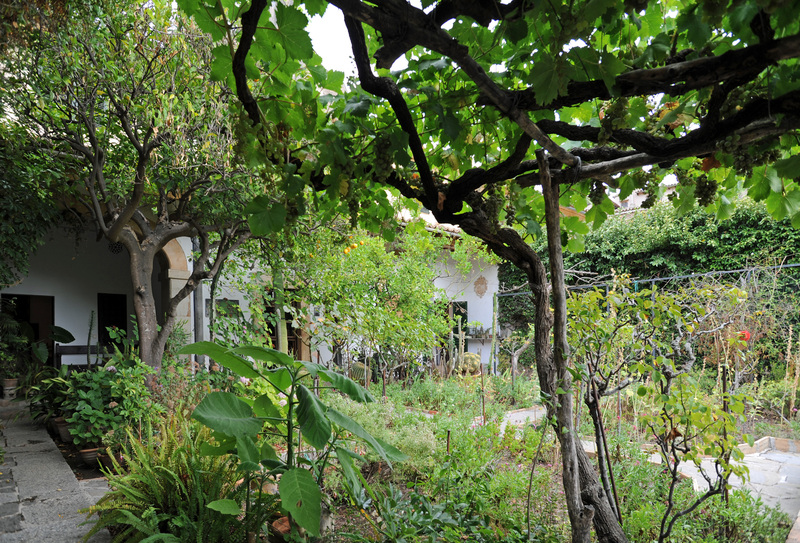 Cells where lived George Sand and Frédéric Chopin, lovely views are available on the plantations of carob, olive and almond trees that surround the village. 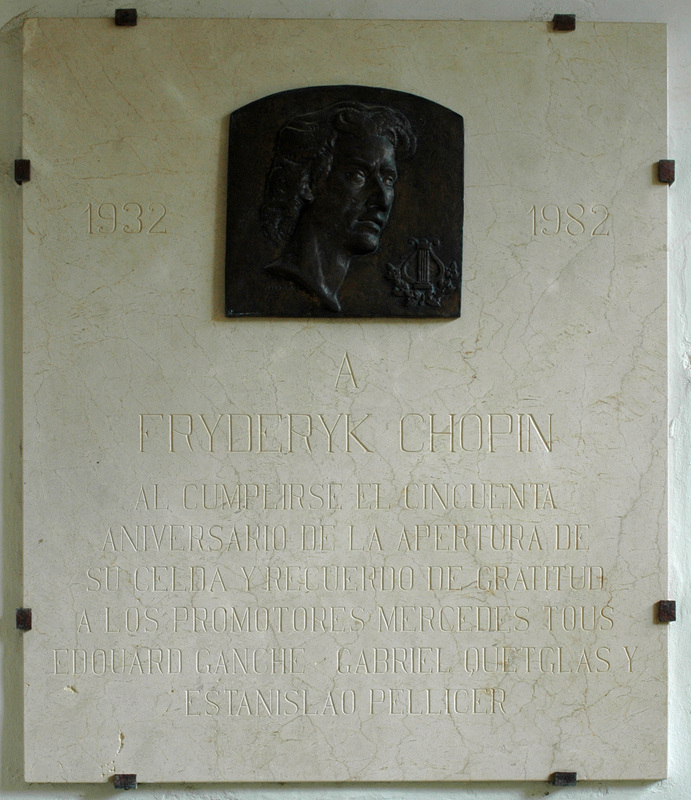 The layout of the cell is the same as the time of Frédérick Chopin. "My piano is not happened yet… I dream of music, but I can not make it because here there is no piano. It is from this point of view, a wild country "
Chopin wrote to his friend Camille Pleyel November 21, 1838. 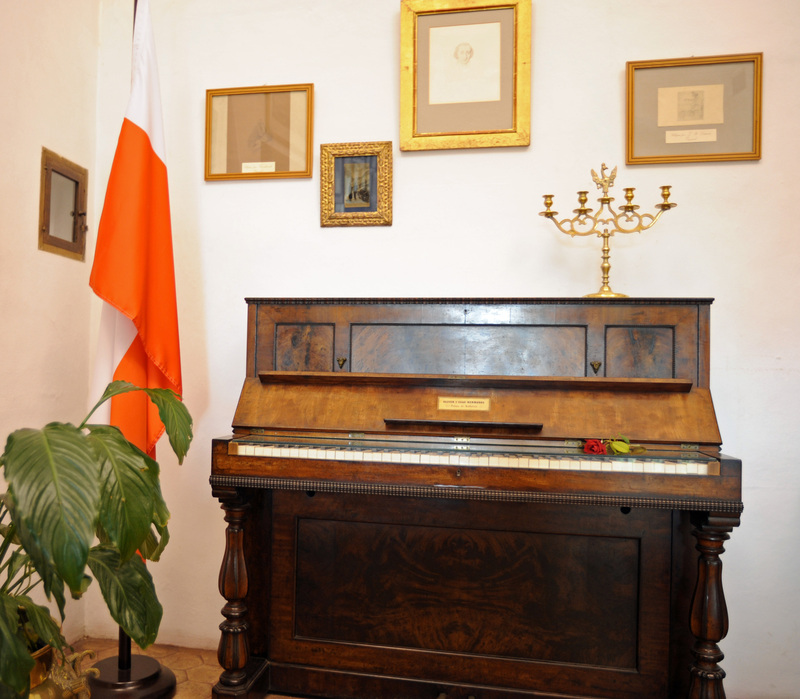 With this piano he composed the opus 28 Preludes, Ballade opus 38, the Scherzo opus 39, the Polonaise opus 40. "Dear friend, I finally send my preludes, I could finish on your piano happened in the best…"
A document authenticating the Pleyel piano. 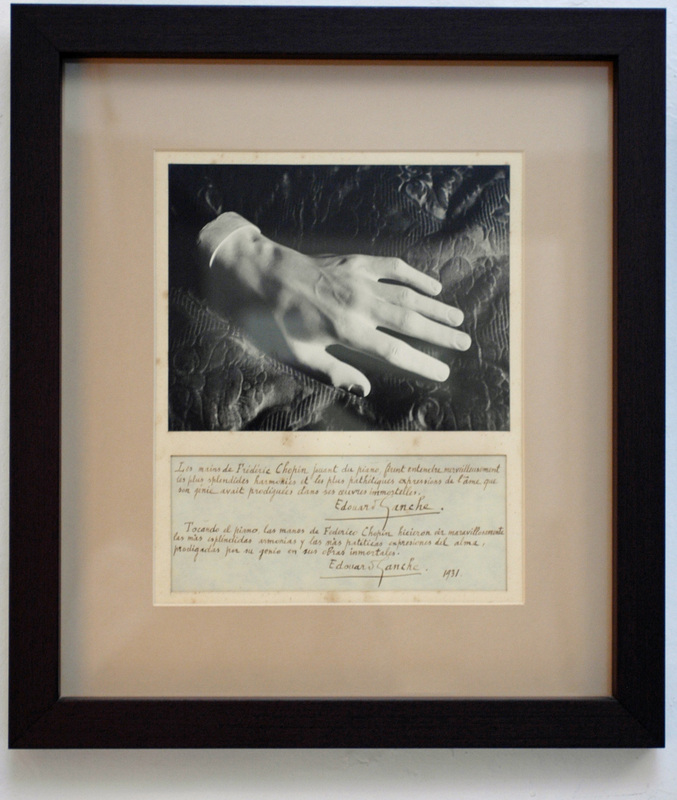 The letter of recommendation and unlimited credit Canute banker George Sand brought from Paris and handwritten autograph letter sent by Chopin Marseilles banker Canute purchased for the sum of 1200 francs, the Pleyel piano. 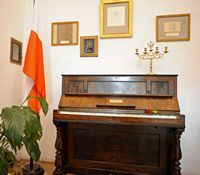 Behind the piano, the flag of Poland given by the Embassy of Spain in this country on behalf of the Chopin Society in Warsaw. 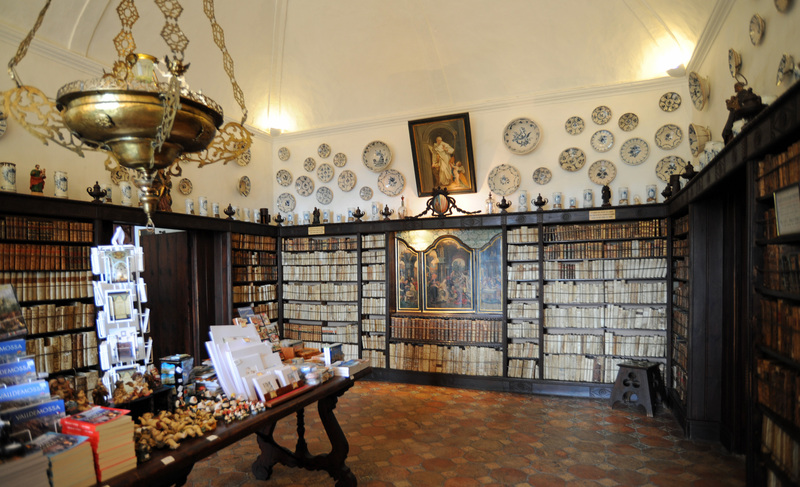 In the central room - which was the office - and in the window are stored documents to stay Frédéric Chopin and George Sand and the cash book of the bank where Canute staff Madame Sand account figure. 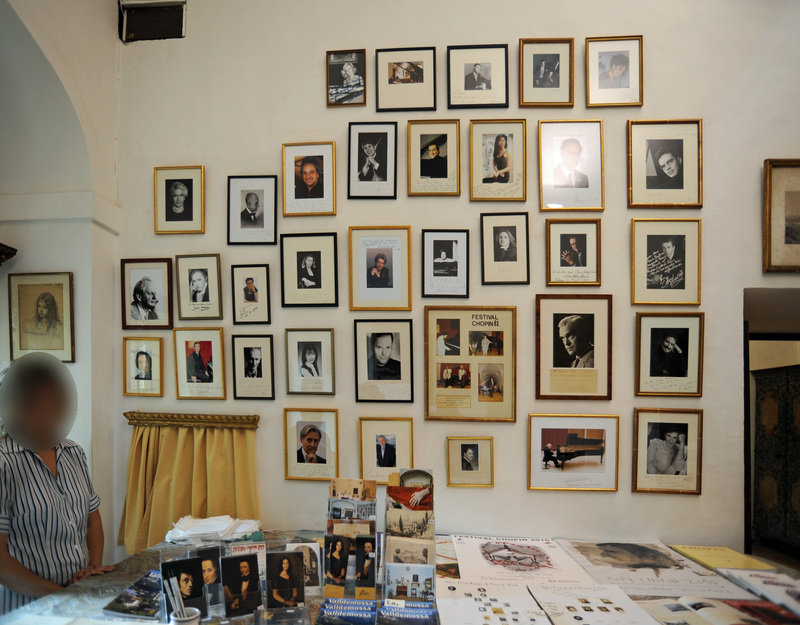 Several portraits of Chopin, his family and the house of his birth. 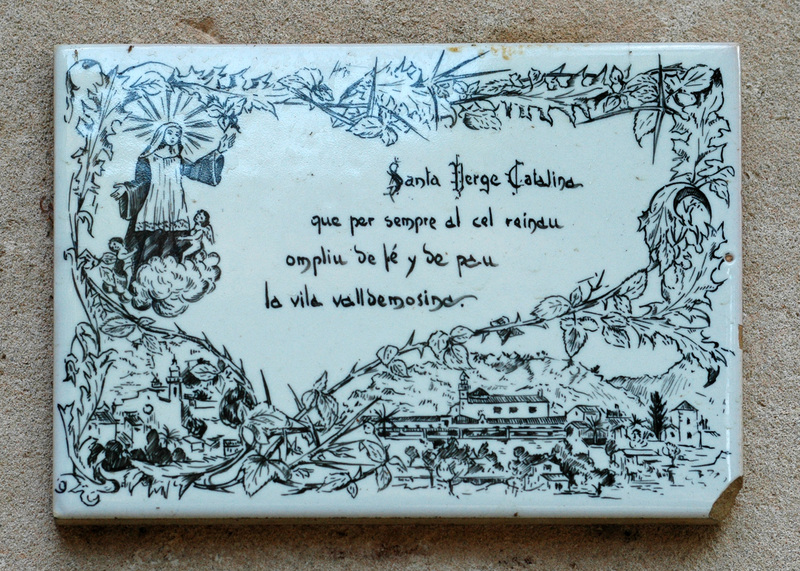 a reproduction of the drawing by Maurice Sand, representing the cell they lived in the monastery. 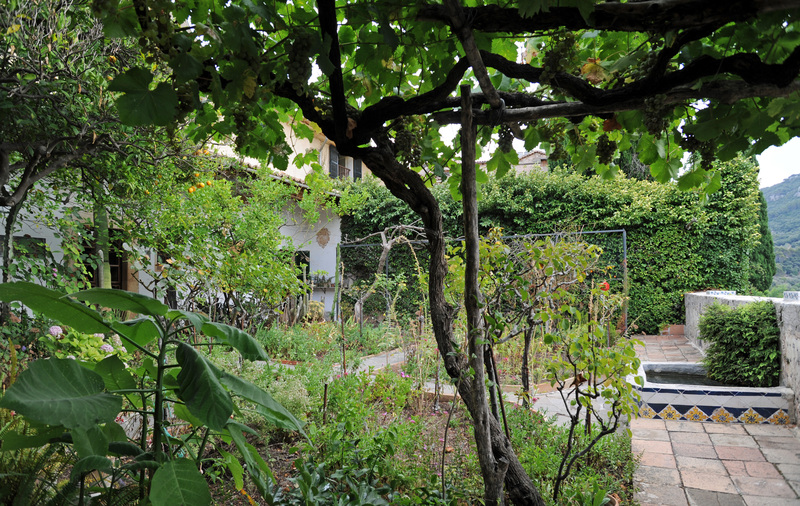 The current garden was once the garden of the Carthusian monks. 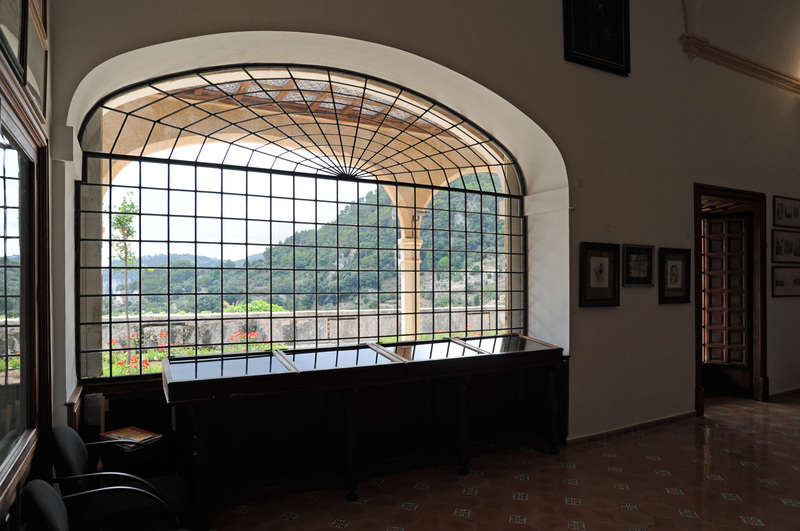 After the cells where Frédéric Chopin and George Sand lived, we visit the Municipal Museum which has four sections: the former printing Guasp, the Museum of the Archduke Louis Savior, art gallery and the Museum of Contemporary Art. 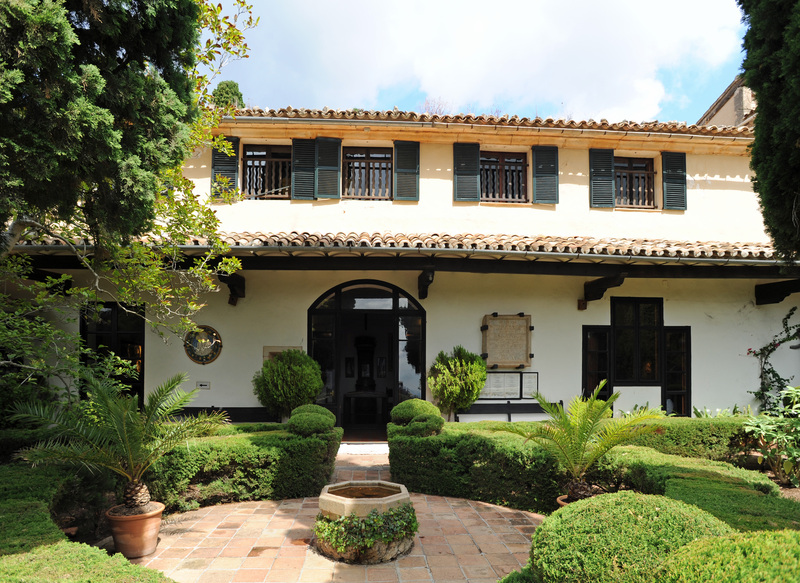 Founded in Palma in 1579 by Gabriel Guasp, printing Guasp was operating without interruption and in relation Guasp family for three and a half centuries. In 1950, the introduction of the linotype made it obsolete, and it is put on sale. 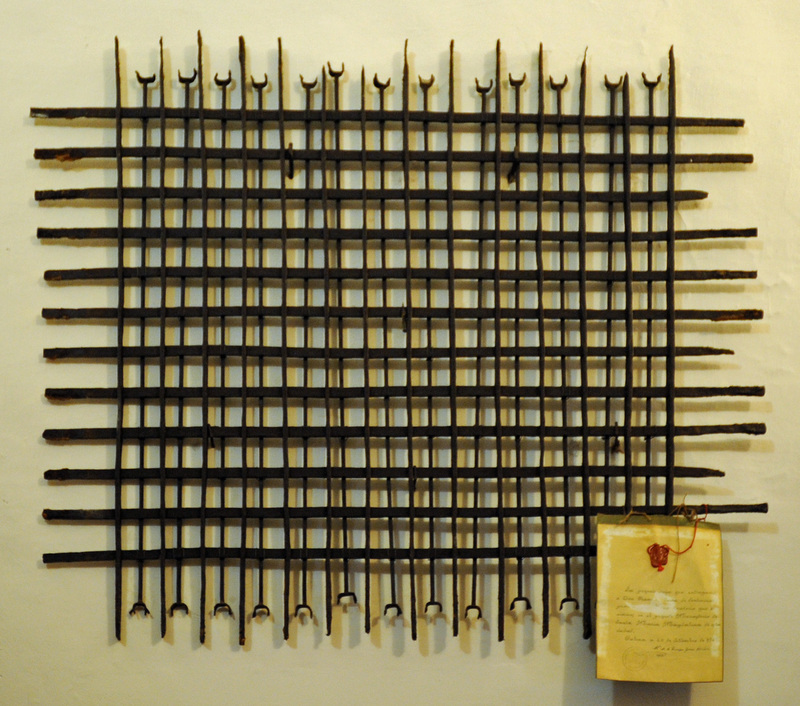 Tomás Capllonch the recovery for the heritage of Mallorca and placed in the cell of the Municipal Museum in 1960. Collection 1584 woodcuts and wood engravings of the sixteenth century to the nineteenth century and a hand press, dated 1622. One of the richest and best preserved in Europe in religious iconography sets, geography, astrology, history, games, heraldry and primers. In the windows are exposed globe Volpelio and Girava, the board game, card games, et cetera. 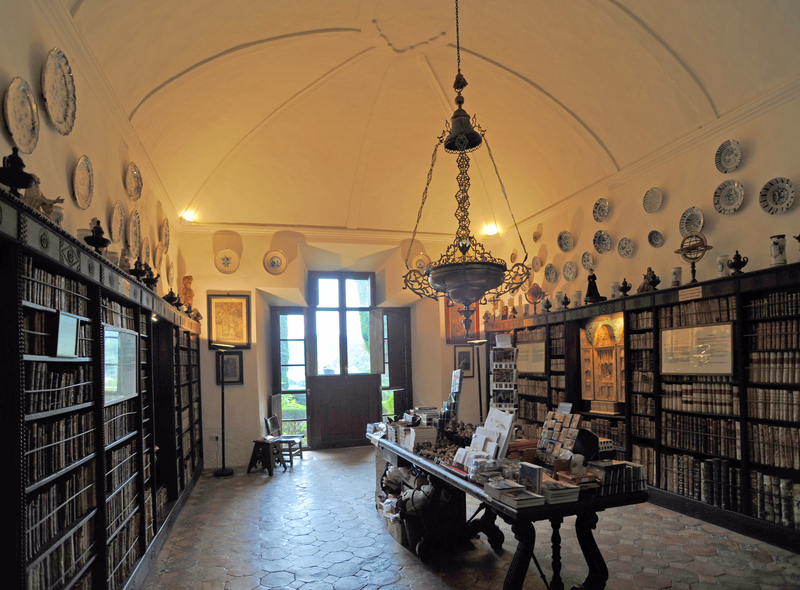 On the walls, copies of engravings executed on the old press on woodblock matrices of the collection. 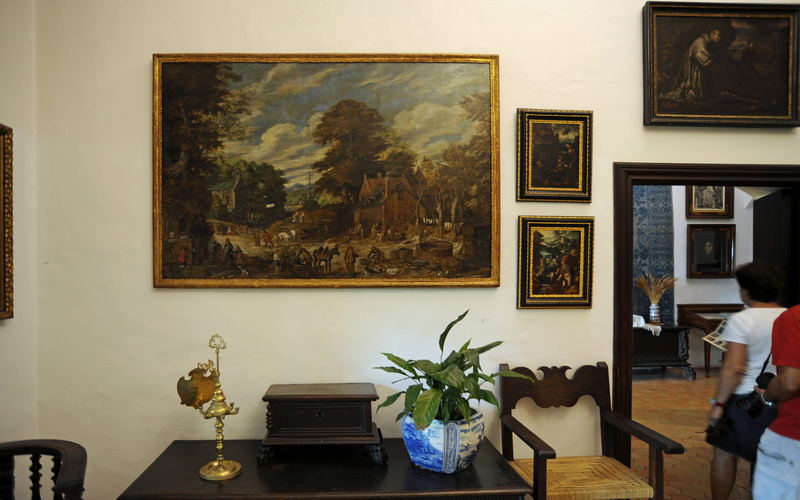 Ludwig Salvator von Habsburg and Bourbon was an inveterate traveler, he was the author of more than sixty works, including the monumental "Die Balearen" we can contemplate in this room. 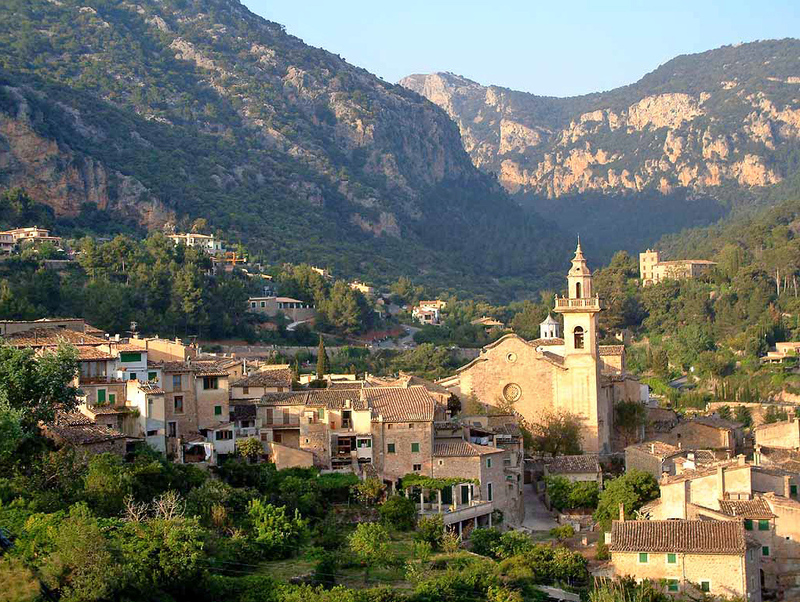 From the late nineteenth century to the present, a series of the most important painters Majorcan, Spanish (especially Catalan) and foreigners have adopted the "Serra de Tramuntana", the center of which is Valldemossa, as inspiration. 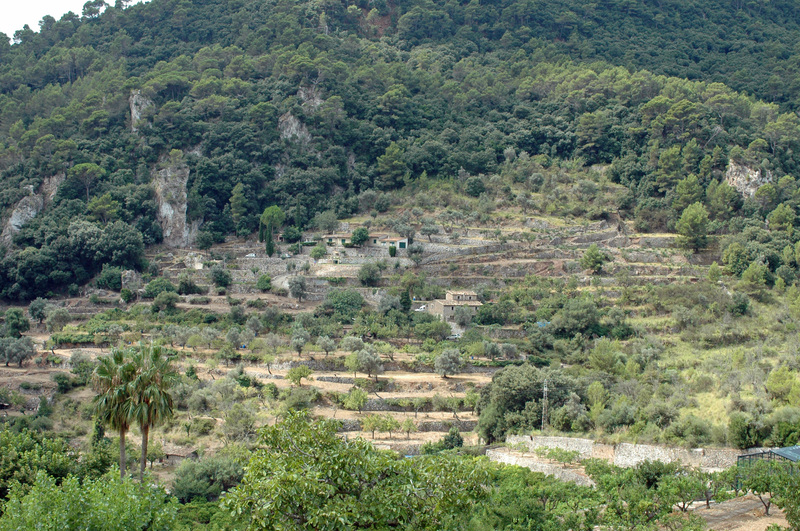 Among the Majorcan are Anckermann Ricardo, A. Fuster, A. Ribas, B. Ferrá, A. Gelabert, P. Montaner, Fuster Valiente, J. Sureda, C. Pizà, Juli Ramis et cetera. 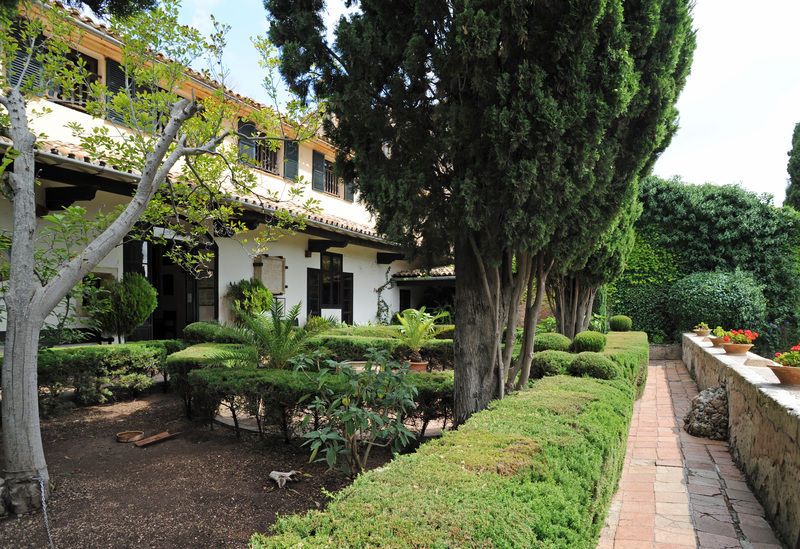 Among the Catalans must include Mir Rusiñol Meifrén, Galwey, Junyer, Fibla, Bergnes, Joan Junyer, Gimeno, Anglada et al Bardolet, as well as Spanish Sorolla, Ochoa and Osés also worked here. 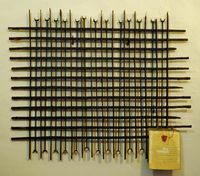 Among the foreigners, Vuillier, Hubert, Sargent, Brugnot, Sweeney, Werner Weber, Cittadini, Bemareggi, Aligi Sassu, Bruno Zupan and Nils Burwitz. 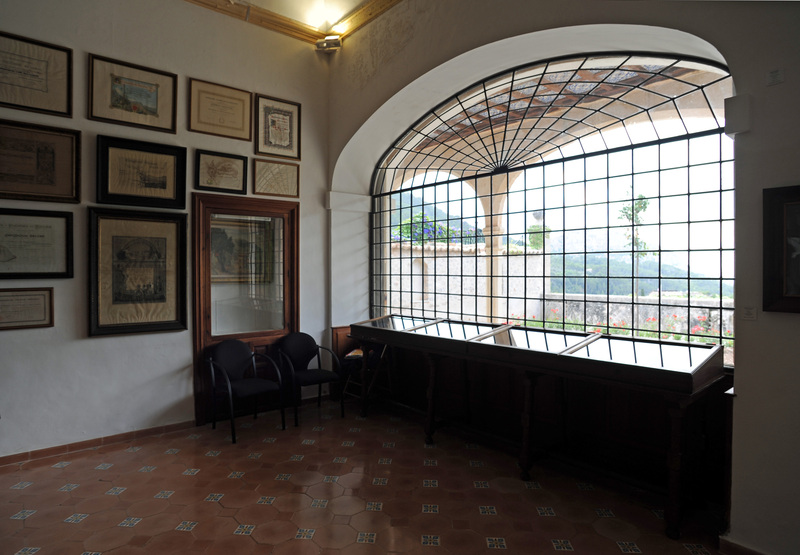 This section occupies the entire upper floor of the Municipal Museum and houses a collection of paintings and engravings of the most significant European painters of the twentieth century. 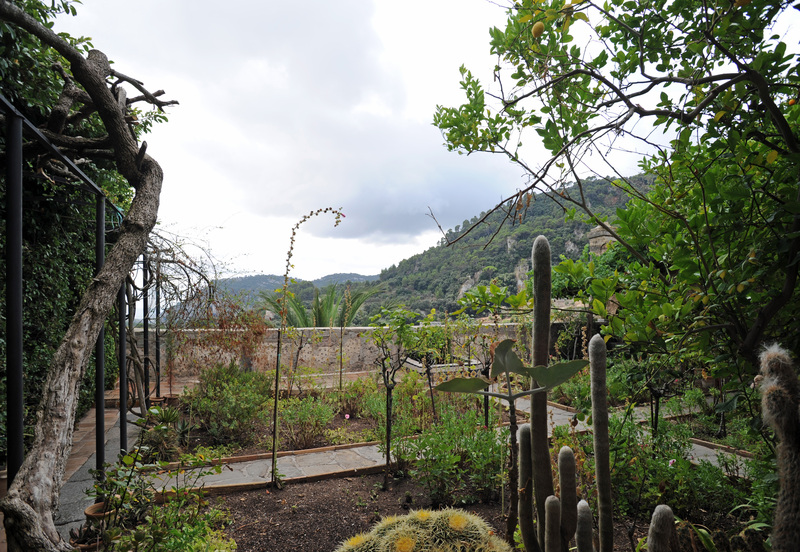 This section has been designed around the figure of the most important painters Majorcan between 1930 and 1980: Juli Ramis (1909-1990) and European painting of the twentieth century with special reference to Joan Miro and Pablo Picasso. 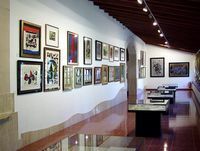 In the entrance hall, a series of works by Ramis between 1930 and 1960, which shows the course of his artistic development. Followed by a large nave with works by Ramis, along with those of his companions in Paris: Parra, W. Lam, Nicola de Stael, Hans Hartung, Poliakoff, Fautrier and some paintings of the group El Paso (Saura, Miralles) and other international names (W. Faber, K. Appel, Domenico wildebeest). 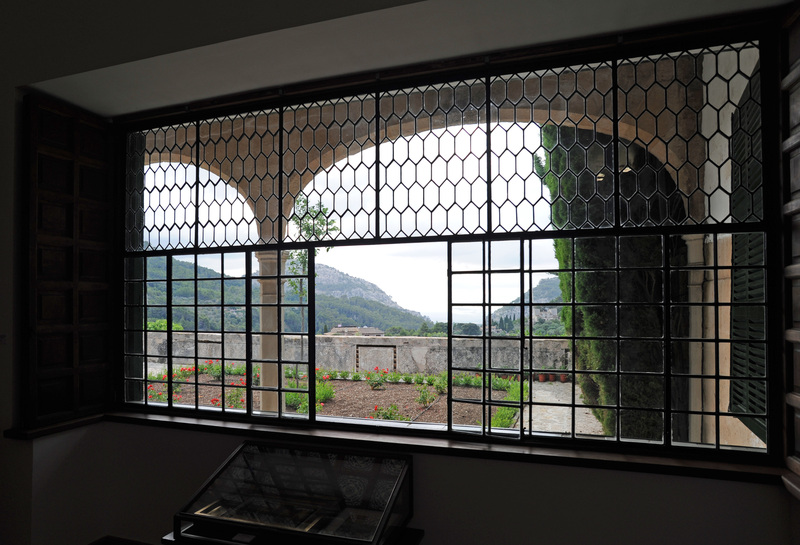 The central windows and wall of the large room dedicated to the memory of Joan Miró. 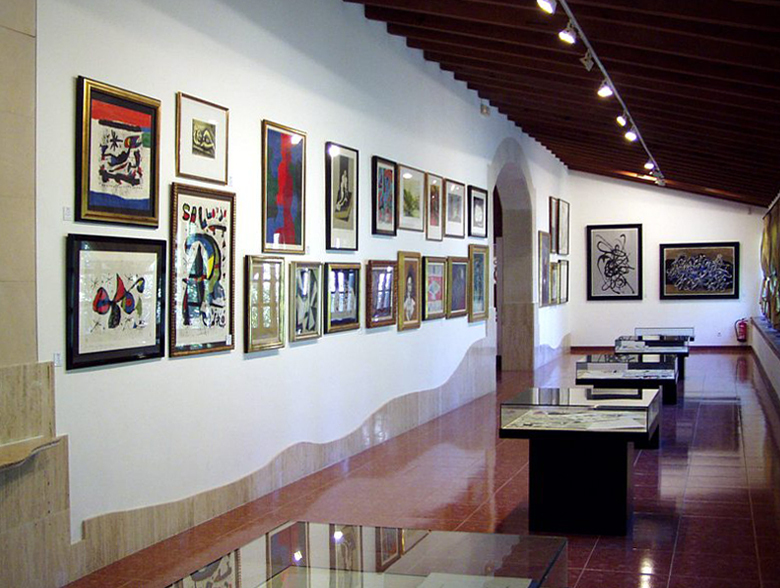 Continuing the tour, there is a series of prints by Pablo Picasso corresponding to his book, he also exhibited "The Burial of Count Orgaz". 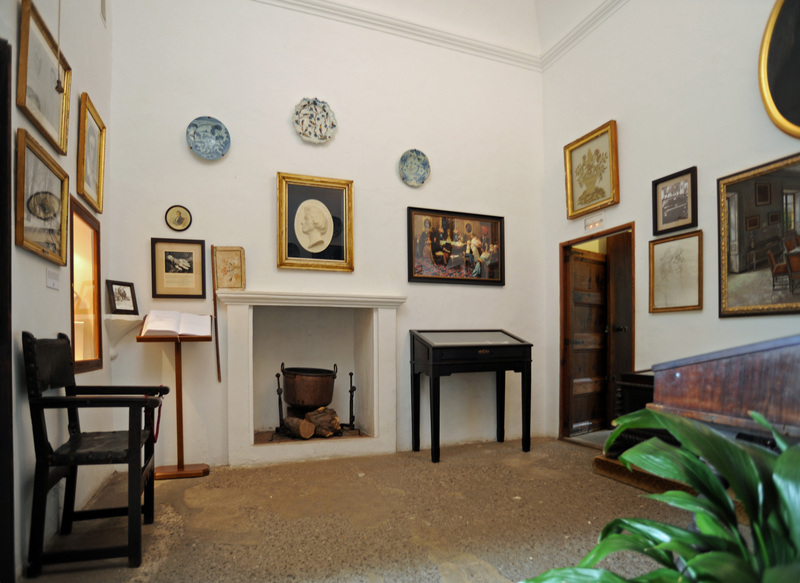 The tour ends with a room dedicated to the presence, through engravings and lithographs, some of the biggest names of this century (Francis Bacon, Henry Moore, M. Ernst, R. Matta, W. Lam Zao Wou-Ki, A. Masson et cetera). 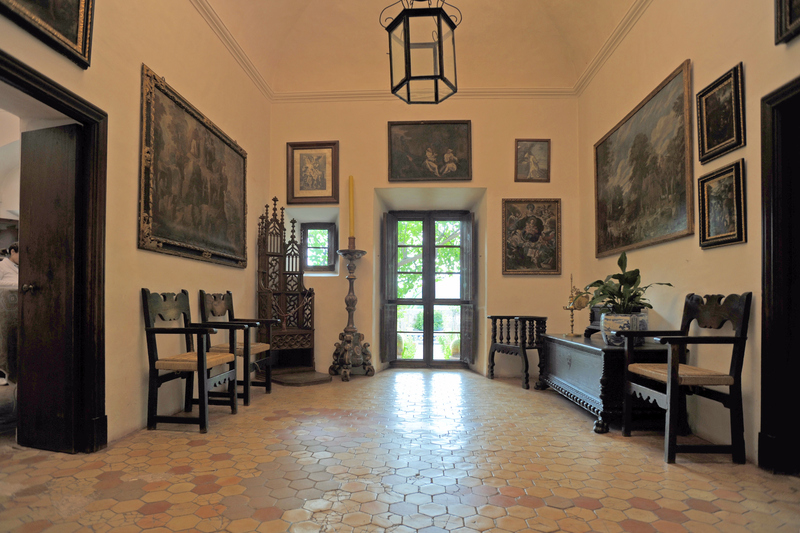 Since the Municipal Museum, the tour continues in retracing his steps, along the corridor, to the opposite extreme of the rose, and finally out through a staircase with four steps on the square of the Chartreuse and access at the Palace of King Sancho, past the studio of the painter Coll Bardolet. 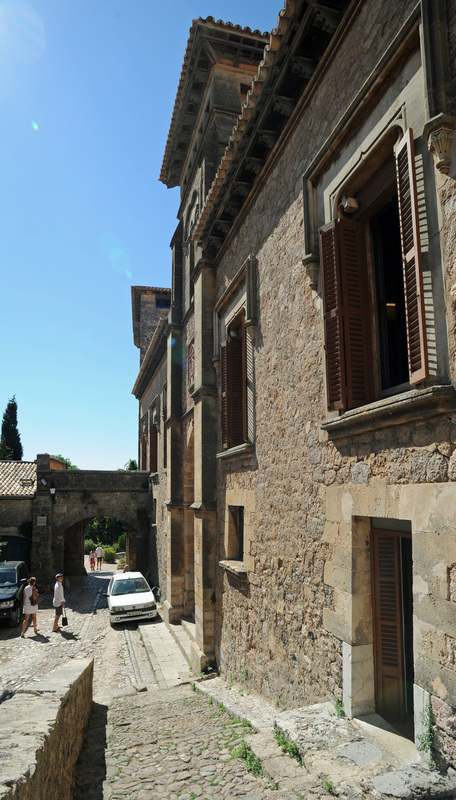 Jaume II, the first monarch of the Royal House of Mallorca, built this palace for his son Sancho, who reigned from 1311 to 1324. 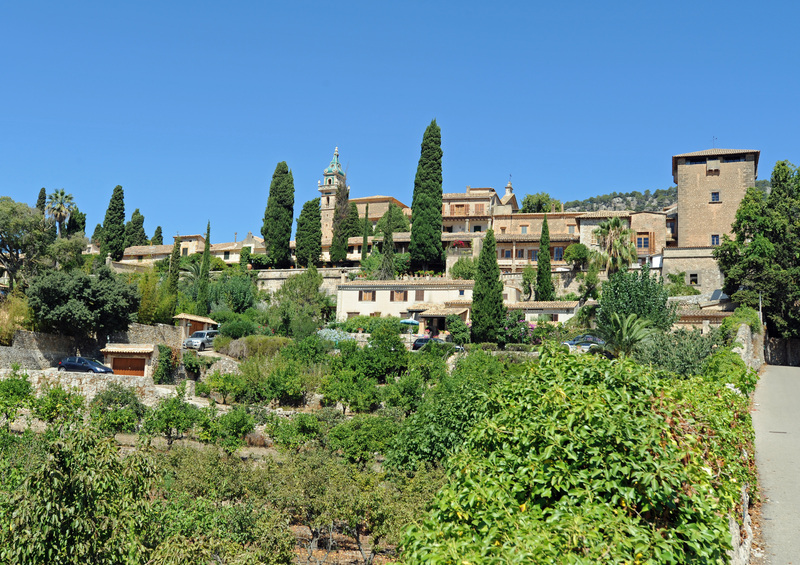 Once the kingdom of Majorca annexed to the Crown of Aragon, "Martin el Humano" gave all his properties to Valldemossa Carthusian monks, who lived in the old palace from 1399, that is in 1717 that the expansion work began. 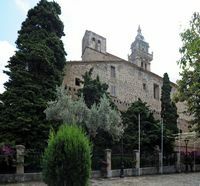 From 1801 to 1802, Don Gaspar Melchor de Jovellanos eminent minister of Charles IV, was imprisoned in the Tower, and was later transferred to Bellver Castle. 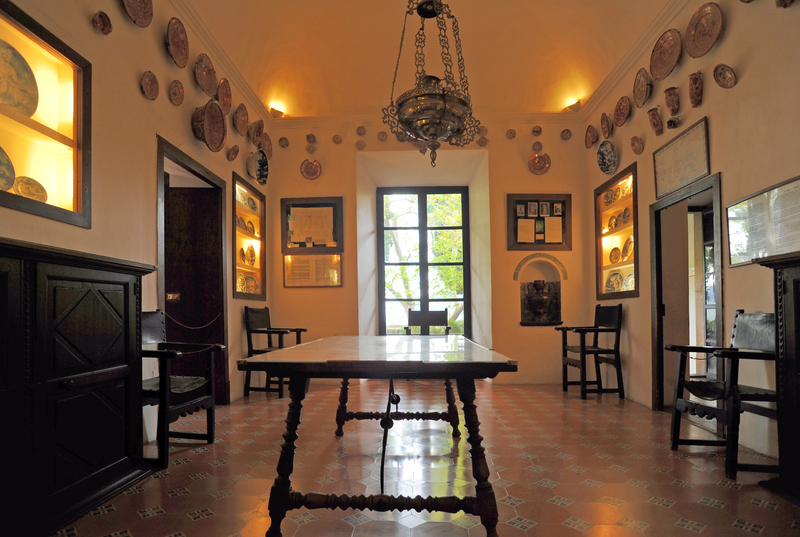 In 1906 and 1913, these walls welcomed the great Nicaraguan poet Rubén Darío, who wore the garb of a monk for inspiration. 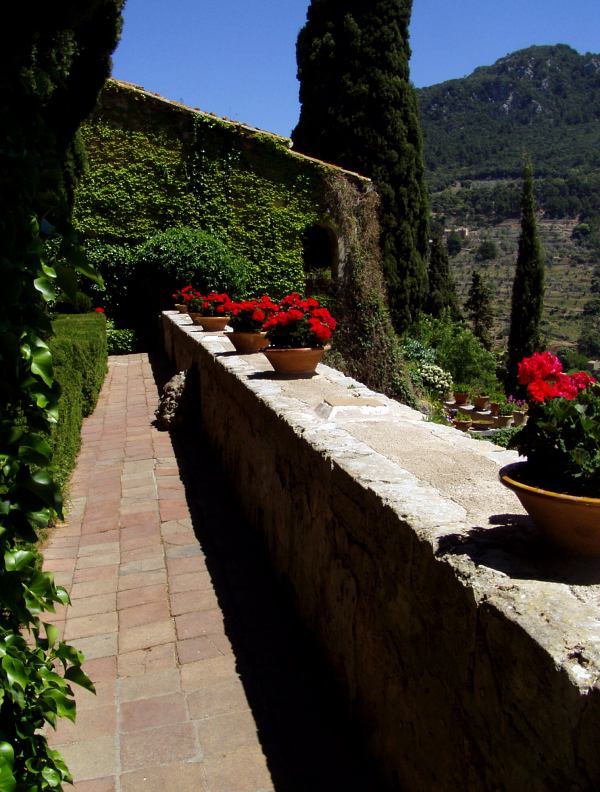 It is established that the kings of Majorca staying at Valldemossa in summer because of the pleasant climate of the city they liked. 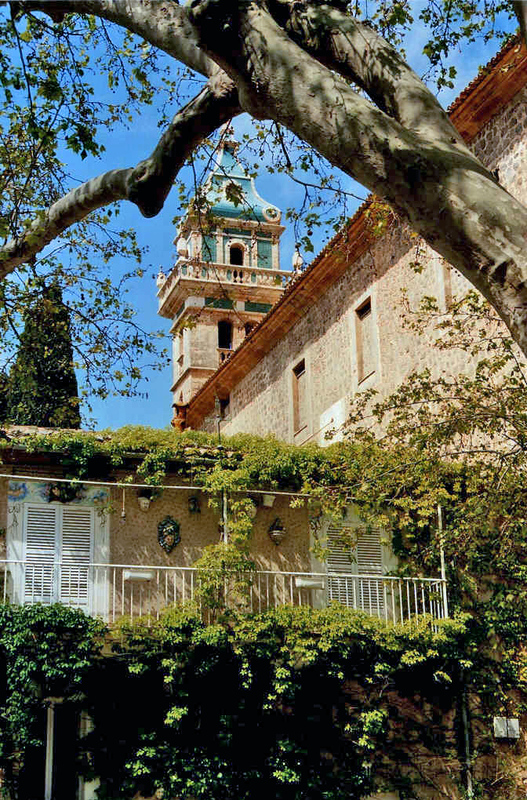 The early fourteenth century King James II (Jaume II) was to build a palace for his son and successor, Sancho I (Sanç I), in the hope of relieving asthma from which he suffered. 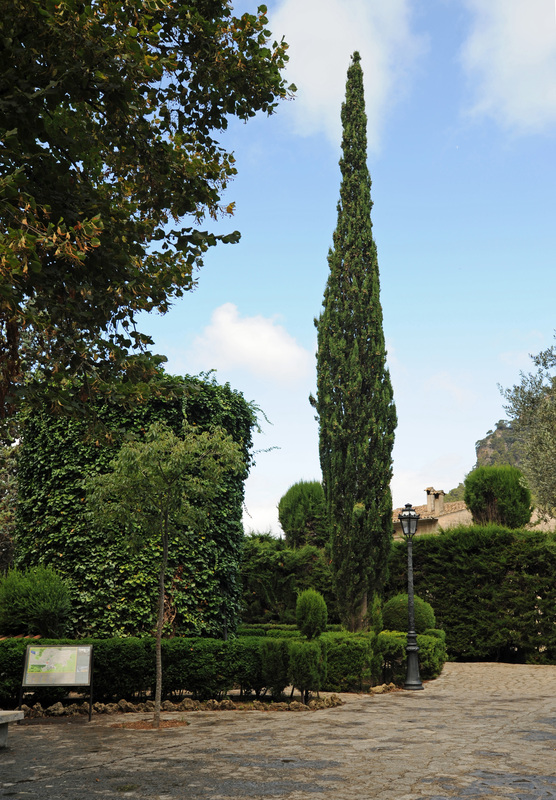 King Sancho went into the palace most of his time until his death in the year 1324. 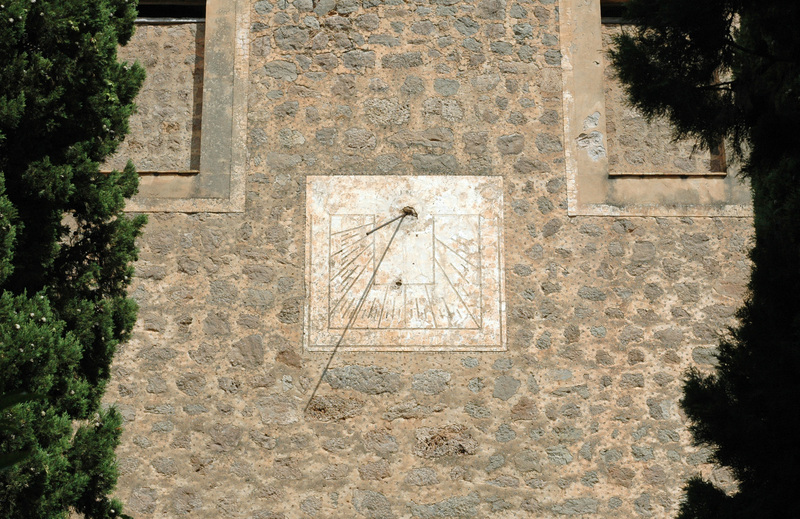 It was at this time that the mystic and philosopher Ramon Llull lived in this region of Majorca. 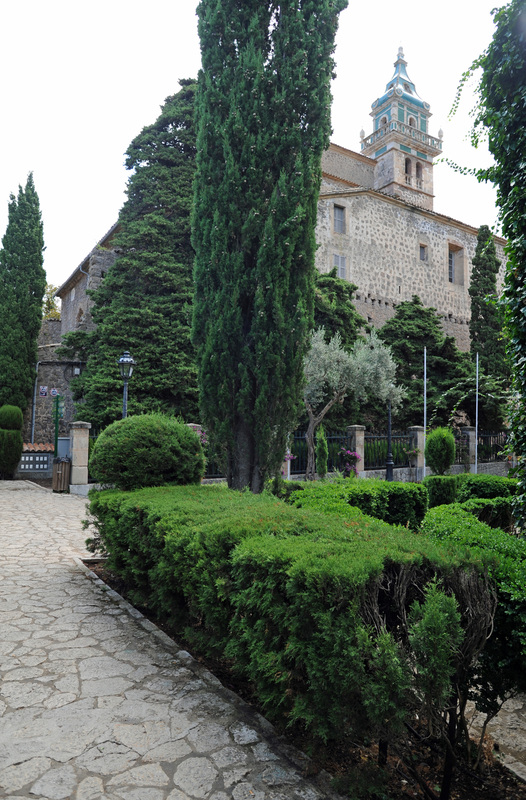 In 1399, the Alcazar de Valldemossa was given by the King of Aragon, Martin I, the Chartreuse de Tarragona, who transformed the palace into a monastery of Carthusian, Chartreuse of Jesus of Nazareth (Cartuja de Jesús Nazareno). 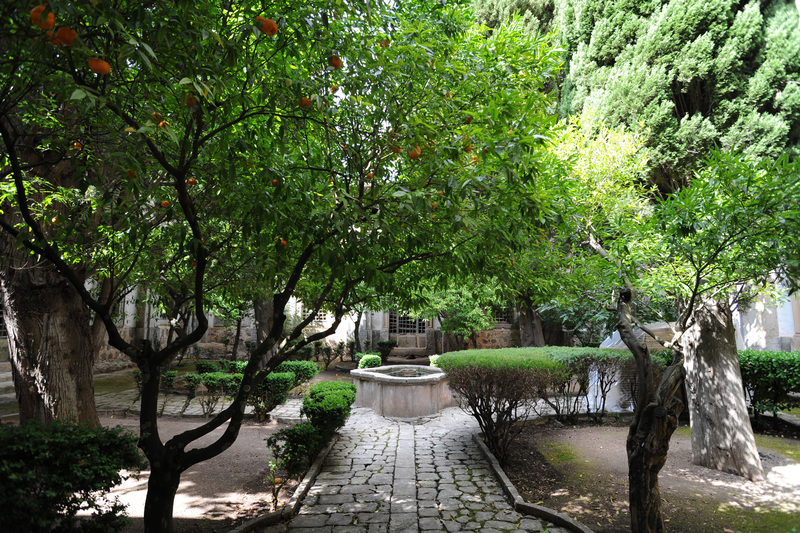 After adapting the existing building new religious uses, new buildings were built around a church and a Gothic cloister which have now disappeared, although other architectural elements of the era are still preserved. 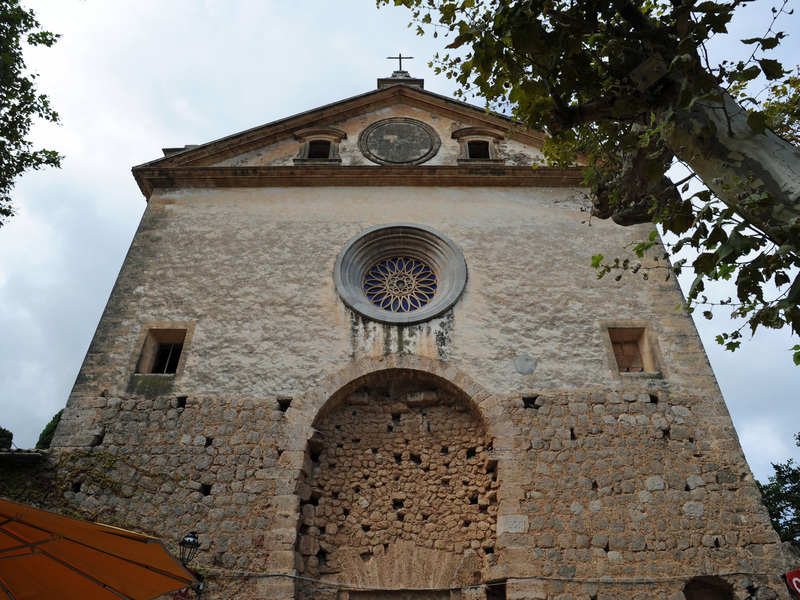 From 1399 to 1767, the Monastic Order of St. Bruno only lived this old building. 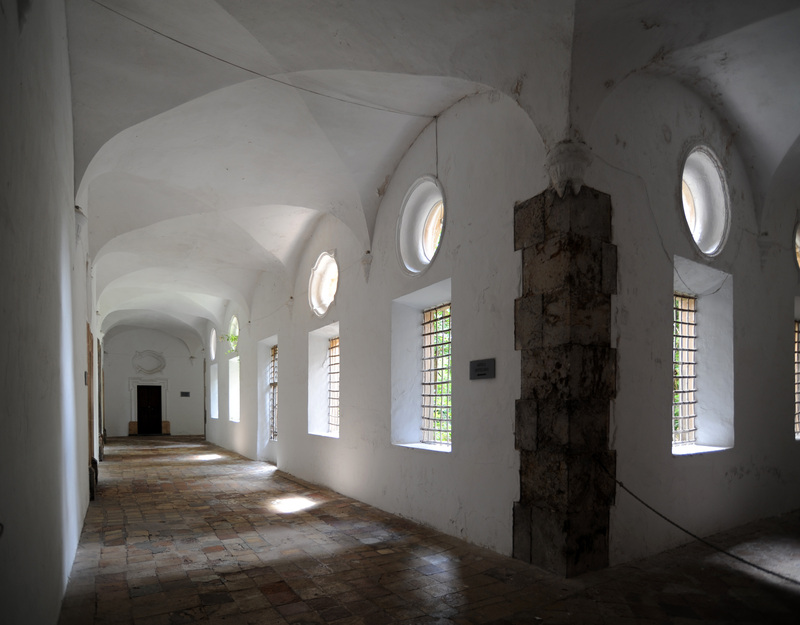 But from 1767, the Carthusians occupied part of the new monastery which includes the cloister and cells. 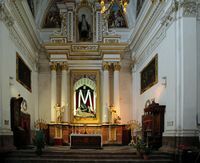 The current buildings date mainly eighteenth century in 1717, the first expansion took place with the construction of a new church and a baroque cloister around which were built of large cells. 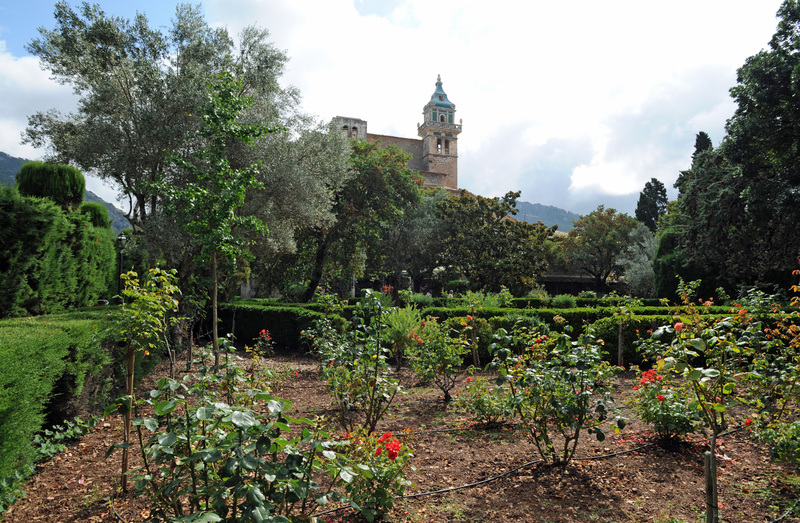 The monastery was to be replaced by another whose scope included all of what is preserved today, plus three other wings of cells, which included the church, the cloisters and gardens in all the dimensions beautiful. However, only a part of the project was executed. 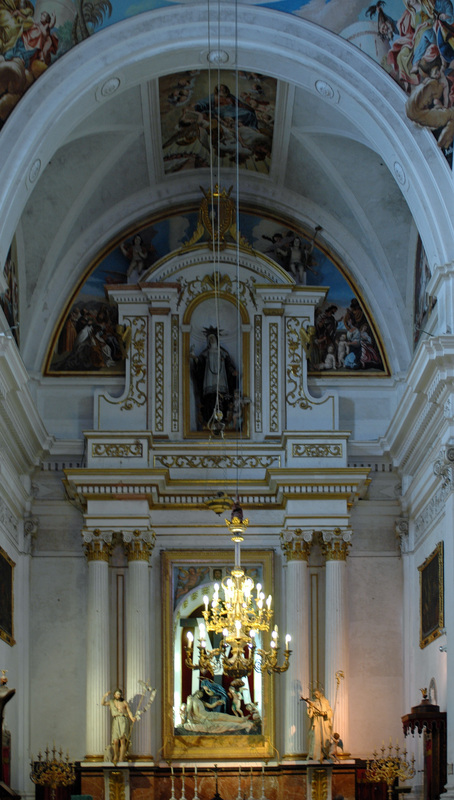 Indeed, in 1835, following the policy of "disamortization" (Confiscation Eclesiástica) the anticlerical government Freemason Juan Alvarez Mendizábal, the monastery was confiscated by the Spanish State, with the exception of the church and other public buildings that remain. 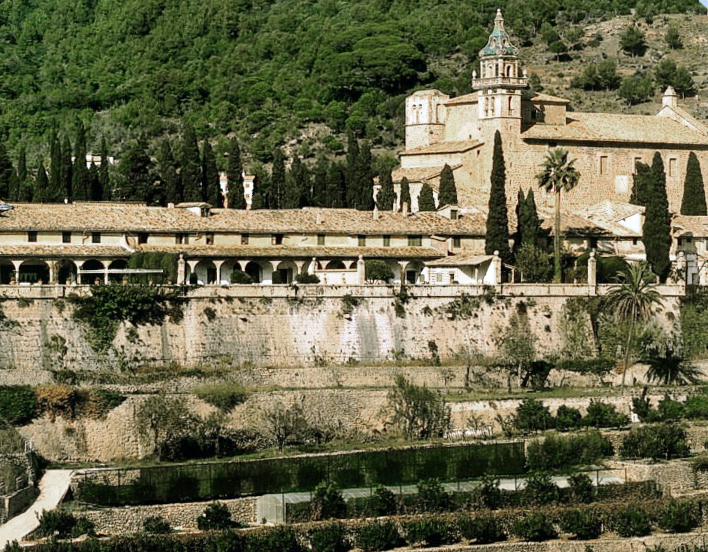 The Carthusians were expelled by the public and authorities declared undesirable in Mallorca. 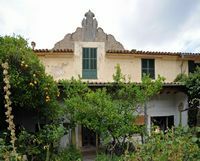 The rest of the historic building, the monks’ cells and other outbuildings, was divided into nine lots and sold by private owners apartment. 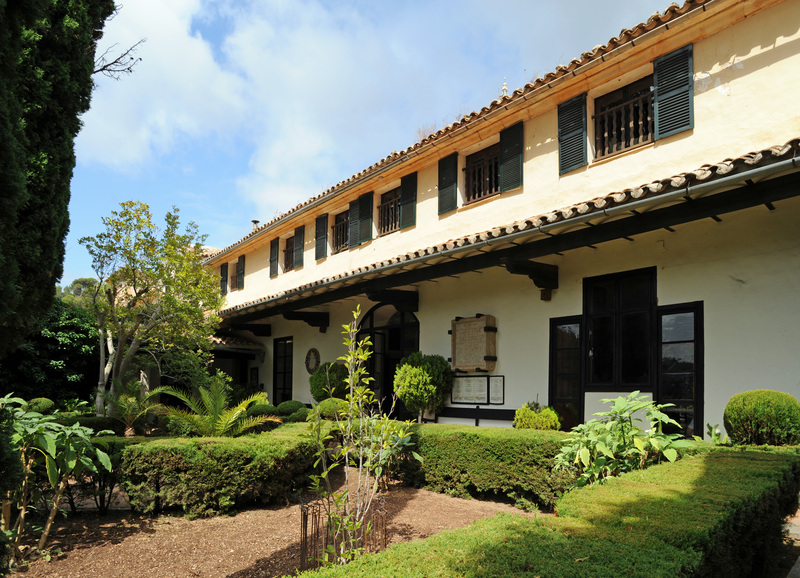 Since the structure of the property has retained this model. 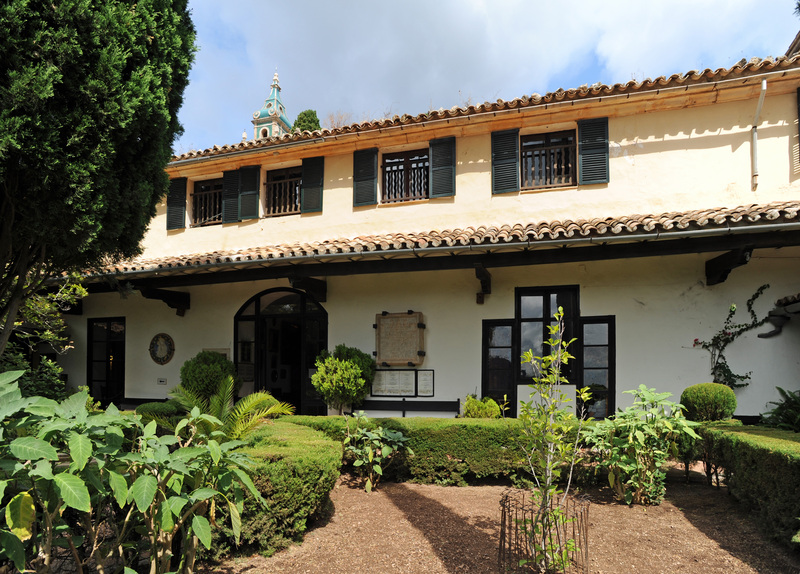 The building has since welcomed guests. These include the Polish composer Frédéric Chopin and French writer George Sand (pen name of Aurore Dupin, Baroness Dudevant). 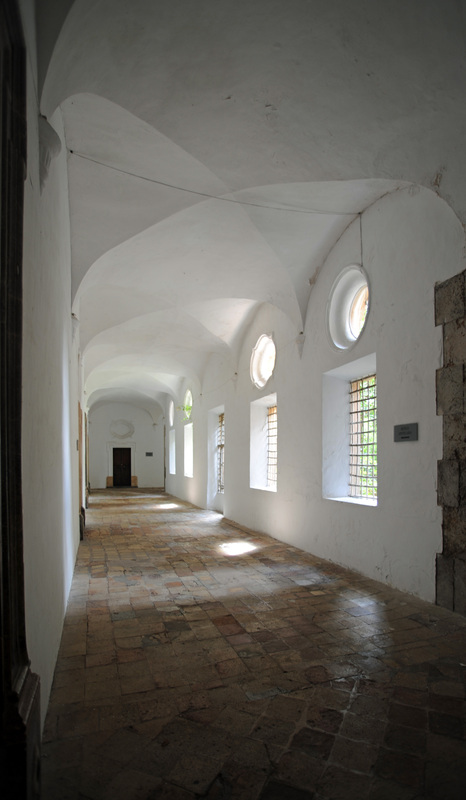 Today the individual cells and parts of the monastery house various museums. 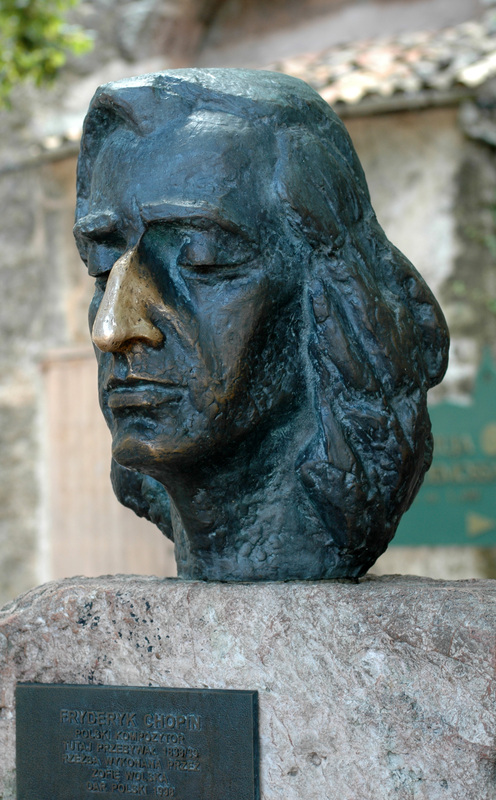 Winter 1838: George Sand and her two children, Maurice and Solange, go to the island of Majorca, accompanied by Chopin. 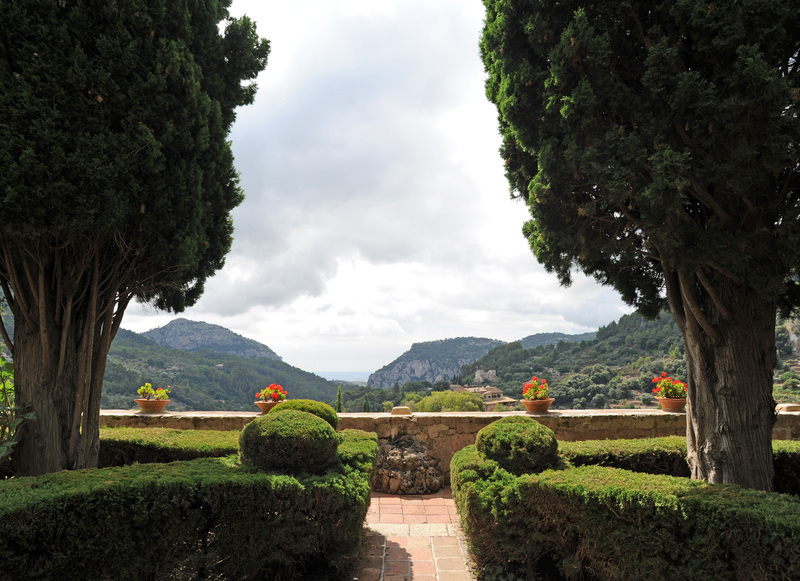 The couple, formed in 1838, wants to provide a honeymoon and looking for a milder climate than Paris for the winter. 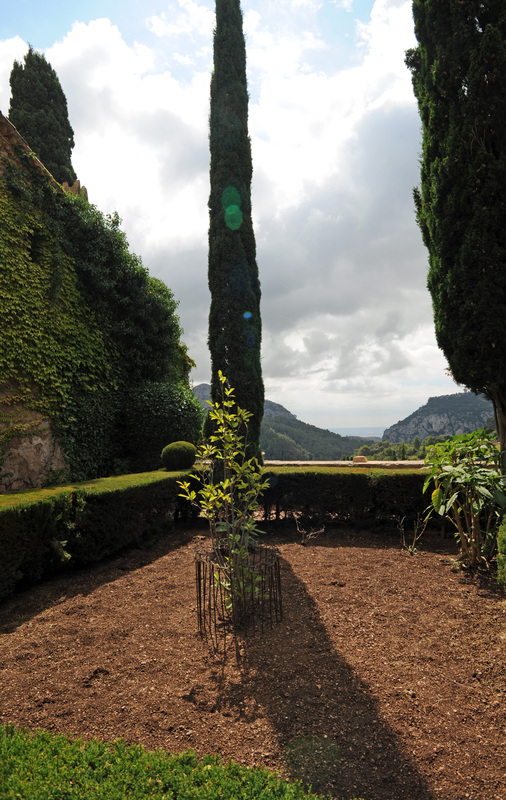 "I find myself in Palma, under palms, cedars, aloe, orange, lemon, fig and pomegranate. 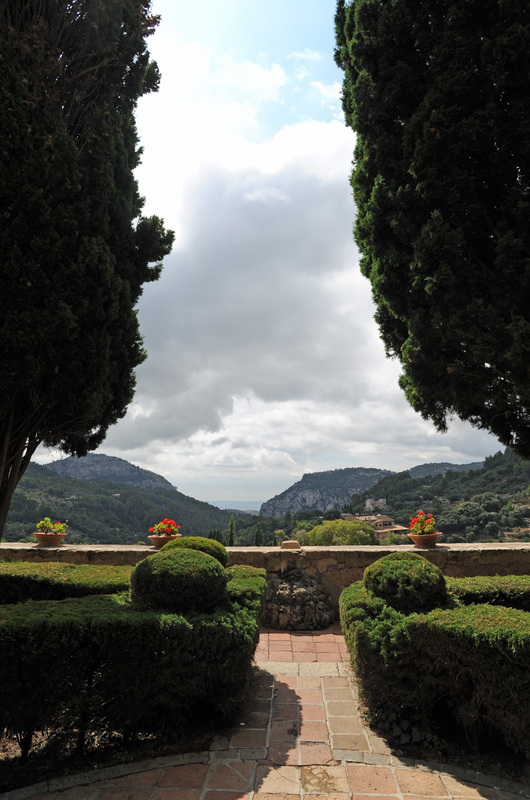 The sky is turquoise, lapis lazuli sea, mountains in emeralds. 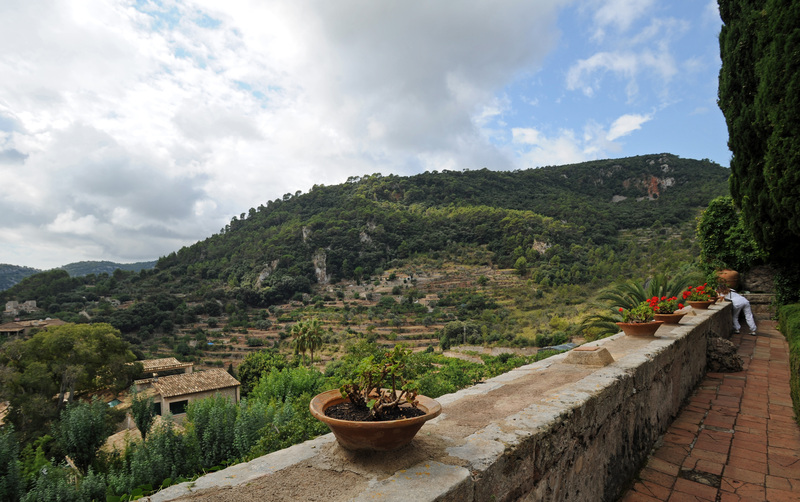 The air is just like heaven… Everyone dresses like summer… and the night is heard everywhere singing and guitars… "
However Mallorca also deserves the kind of city that strays into its path, the slopes of the hills you climb and adorable villages are found. It is in one of its towns removed, the fold of a mountain that the author and the musician put their suitcases. 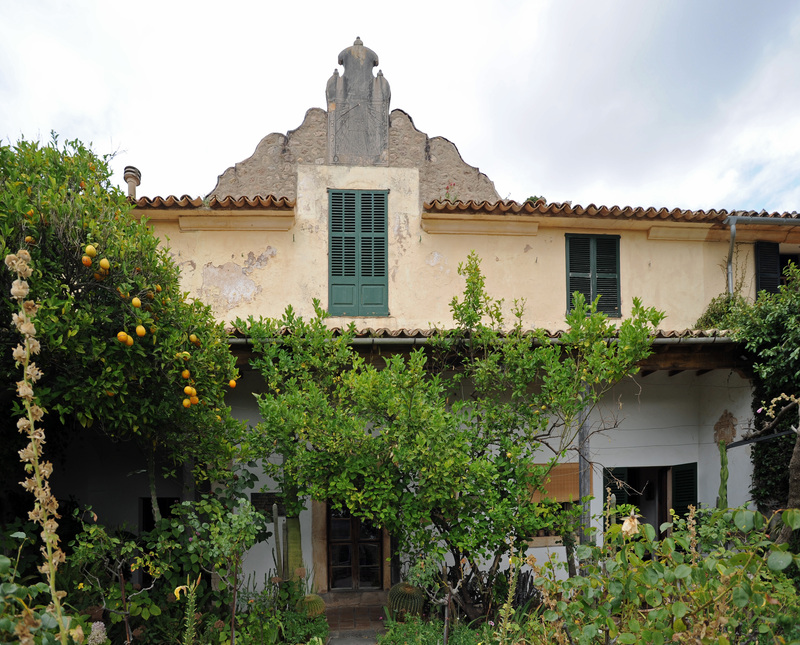 "I’ll probably live a wonderful cloister in the most beautiful site in the world: I have the sea, the mountains, palm trees, an old cemetery, a church cross, the ruins of a mosque, old olive trees. Ah! my life, I saw more… I’m almost there a more beautiful world. I feel better. " Wrote to his friend the musician Julian Fontana. 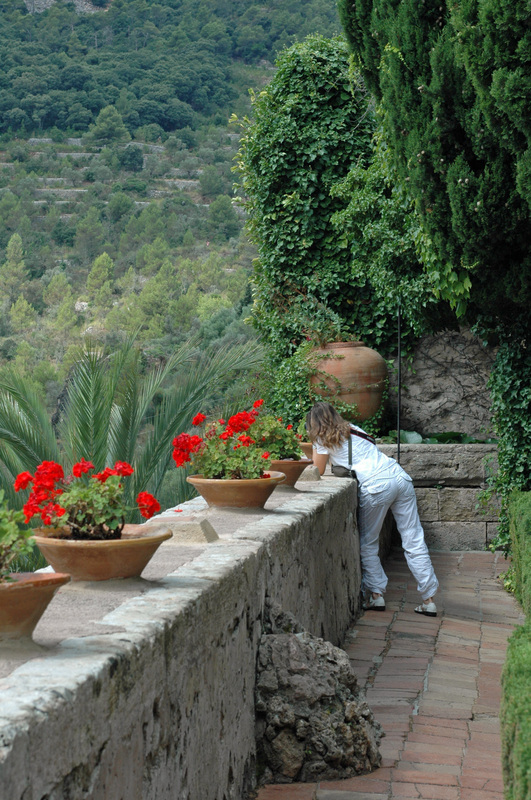 Palma the Royal Charterhouse of Valldemossa, their journey reveals an impressive cultural richness in a beautiful setting. "For it is in vain to defend these claims homes, devoted to a more sinister cult act somewhat on the imagination. " 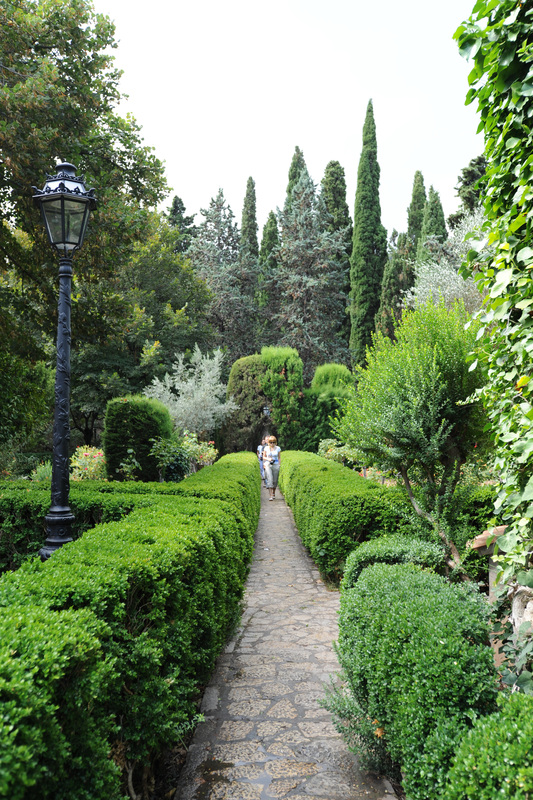 Unfortunately, dreams of Chopin will quickly turn into a nightmare for two months, the writer and Chopin experience a difficult stay away from the quiet tranquility they were seeking. 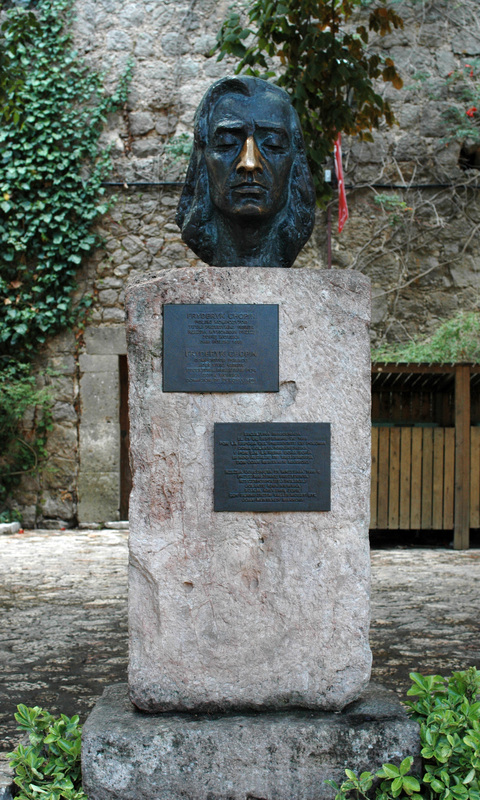 The people of Majorca are hostile to effect this pair of unusual customs for the time and watch as "pagan". 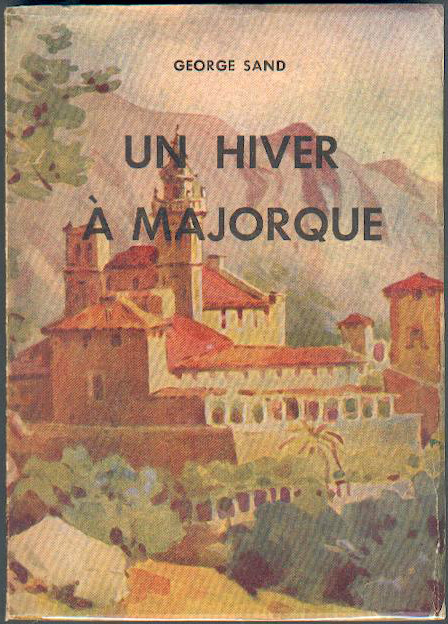 Clashing with the monastic rigor of inhabitants, the couple fails to become familiar with local customs. 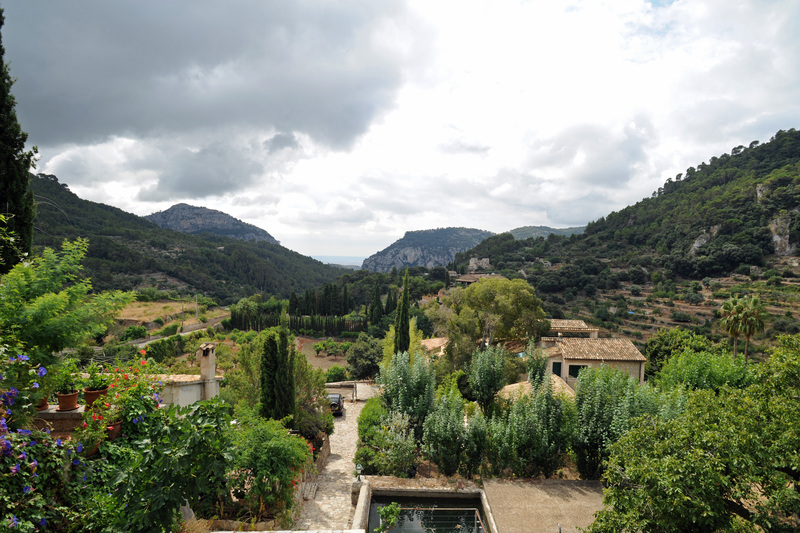 To top it all, the season is unusually rainy this year and the monastery is wet. 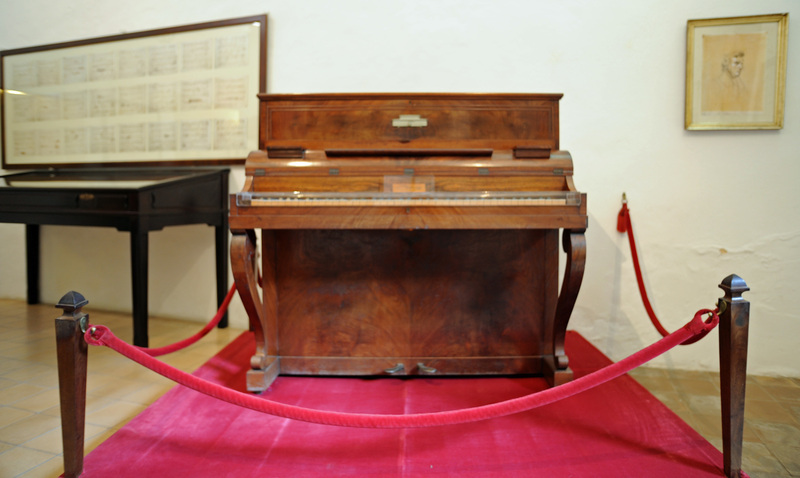 The Pleyel requested by Chopin happens only two months after the start of the holiday. "An evil countries regarding Post, men and comfort. "" My cell has the shape of a large coffin ". "You can scream… always silent. " , That writes the musician. Barely recovered, Chopin to compose again. The scary climate Chartreuse is catastrophically on his morale. "Supporting suffering with enough courage, Chopin could not overcome the anxiety of his imagination. 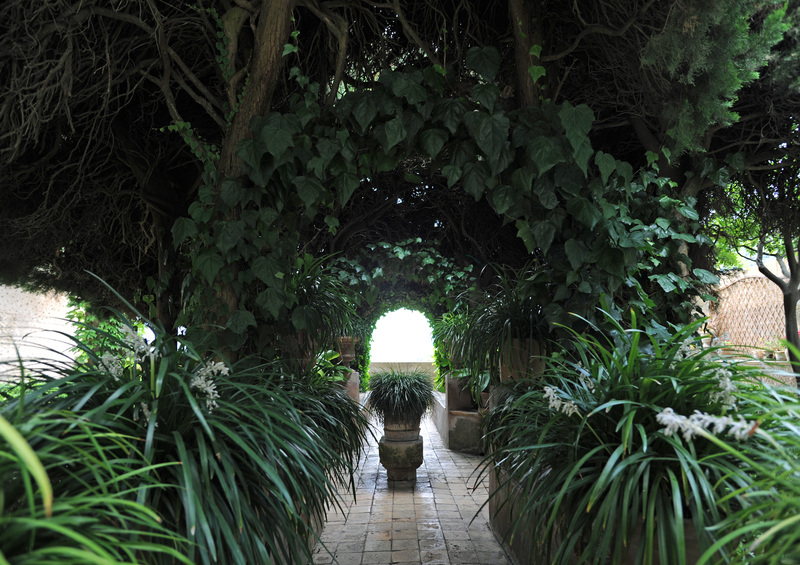 The cloister was for him full of terrors and ghosts, even when he was well. " George Sand said later in his autobiography "Story of my life." George Sand said that several of the preludes are born from these anxieties. There is one, she says, "who came to him with an evening of rain". 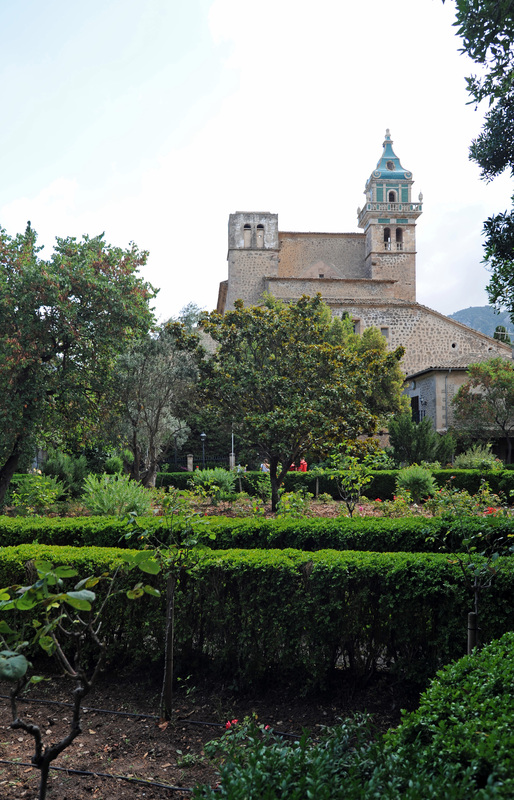 This is the monastery that the musician wrote his famous Preludes, especially the Prelude Opus 28 No. 15 in D flat, said, "The drop of water". 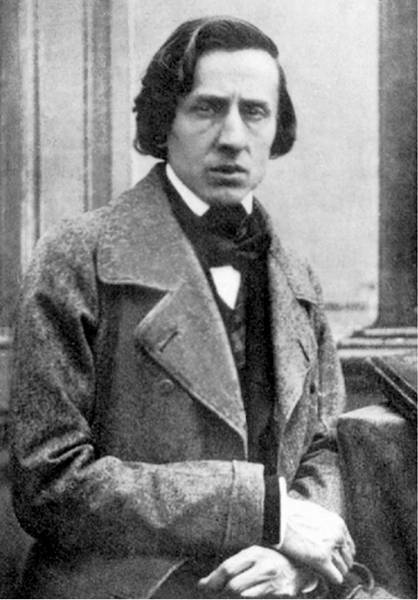 Chopin’s health remains precarious. The rain falls incessantly their moldy clothes on them. The problems become unbearable and the money is running out. Yet Chopin ends the ballad in F major, two Polish, the Sonata in B-flat, and it works the third scherzo. Her condition is getting worse. 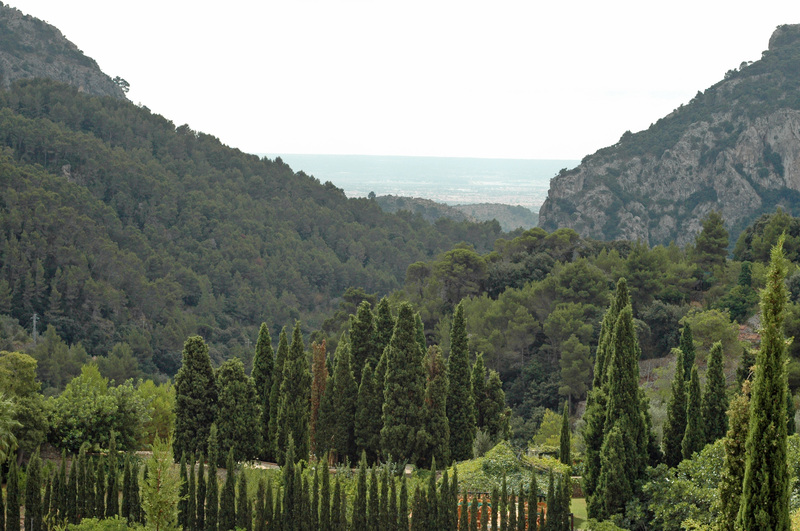 One day when George was out with Maurice, to get to Palma, the rain began to fall, the streams overflowed. 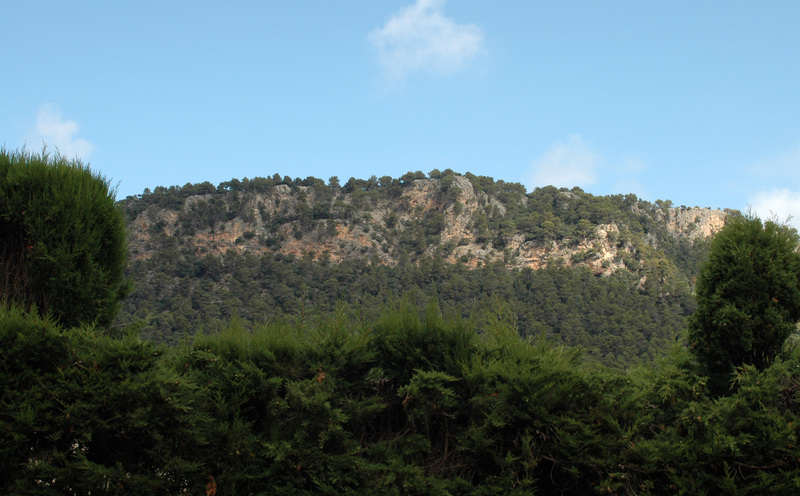 They put six hours to reach the monastery. When George found Chopin, it was wild-eyed and was pale as death. He jumped up and exclaimed: "Ah! I knew you were dead. " 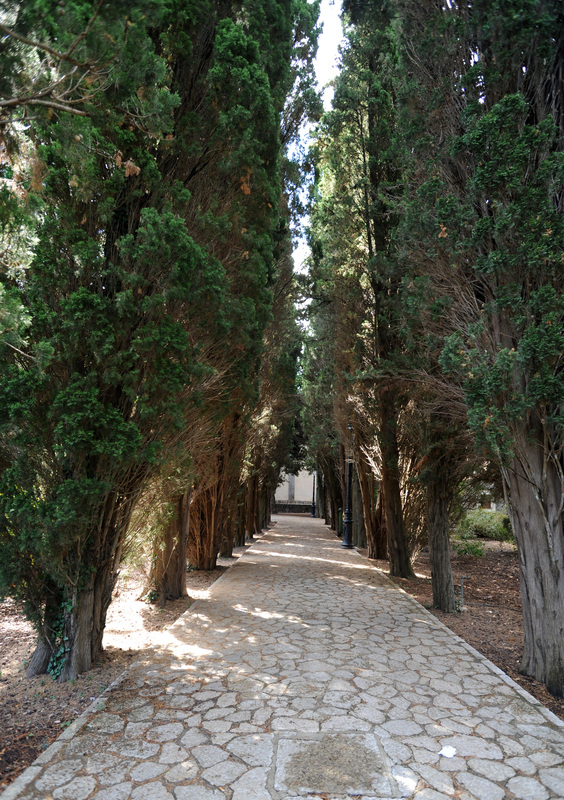 Chopin now takes Mallorca horror. In Chartreuse life becomes unbearable nobody agrees to serve the "consumptive"; domestic leaving the plague they are shouting. 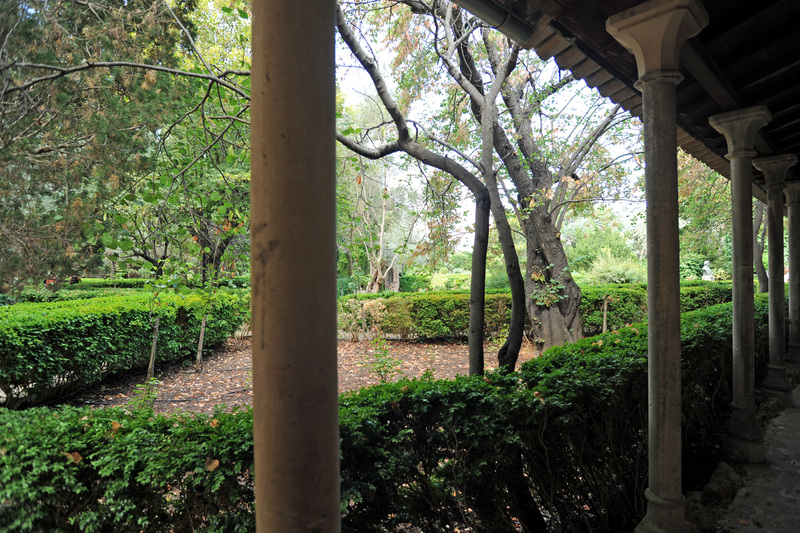 Chopin wrote to Paris to settle his affairs and change apartments, the return is accurate. It aspires only "rest from work". 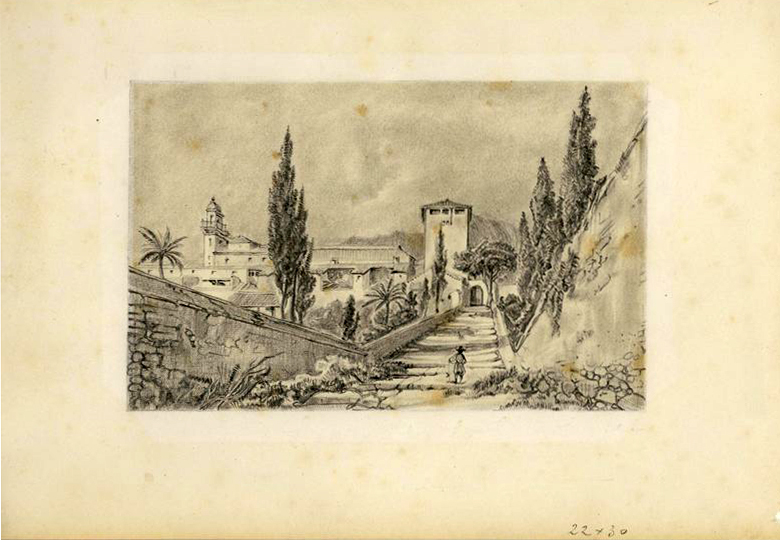 Chopin and Sand hastily return to France in February 1839. 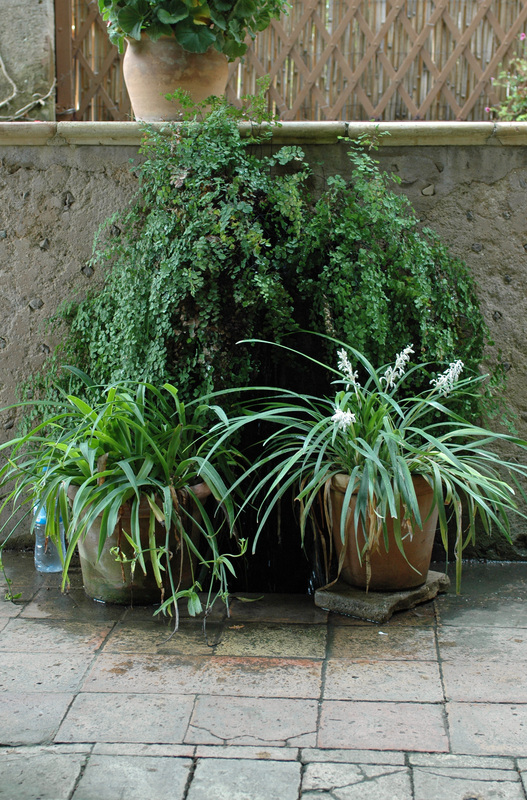 George, Maurice and Frédérick packed up, but denied a car in Palma. Chopin can barely breathe. In the evening he began to spit blood appalling. They manage to board a boat carrying pigs. The next day Frédéric spitting blood at full bowl. Their honeymoon ended on a terrible fiasco. Chopin is hospitalized and the doctor managed to stop the bleeding. "Another month and we die in Spain, Chopin and me him melancholy and disgust, my anger and indignation… they pierced with pins a suffering…" "If I write about them it will with gall.. ". 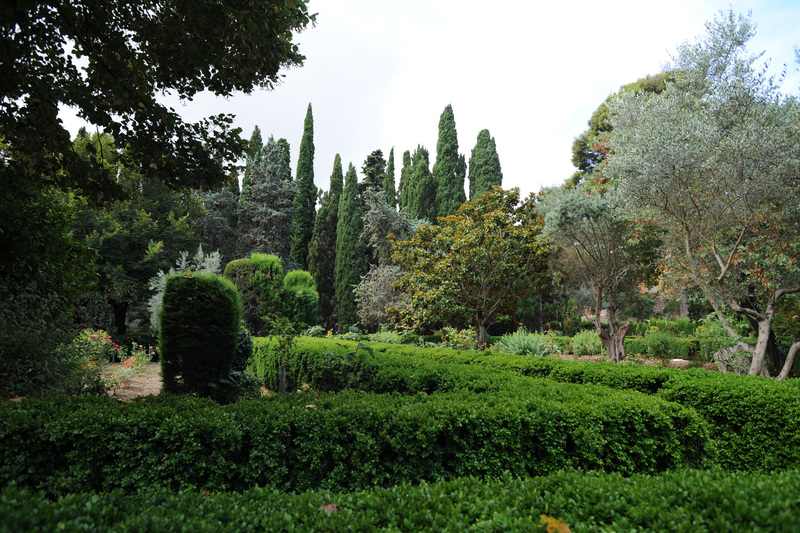 The atmosphere of Mallorca has not altered the quality of Chopin’s compositions during this winter. Rather, it is likely that Chopin translated into music and sublimate these painful places. The composer refers to Paris two Polish opus 40 and opus 28 Preludes, work has already begun the previous winter. One can not help but bring the Prelude Opus 28 No. 15 (says "drop") feelings that Chopin had to experience during their stay. 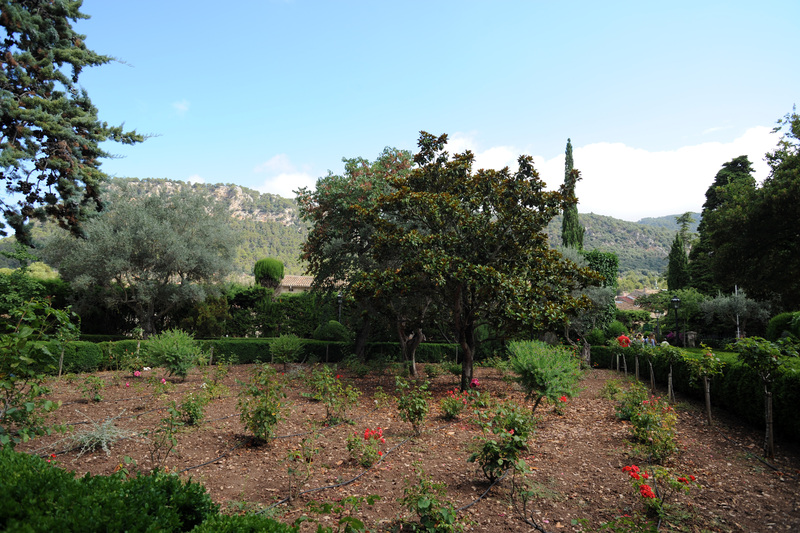 George Sand wrote an account of this trip in "A Winter in Mallorca", describing their stay on the island in 1838-1839 and praising its natural beauty, but criticizing what she considered prejudices and vices of the natives. "Why travel when you are not forced? 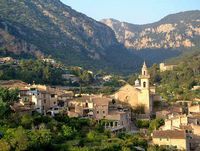 Today, (…) I address the same answer as before the return of Mallorca: Because he does not so much as to travel from: which of us has not some pain to distract or some yoke to shake. " 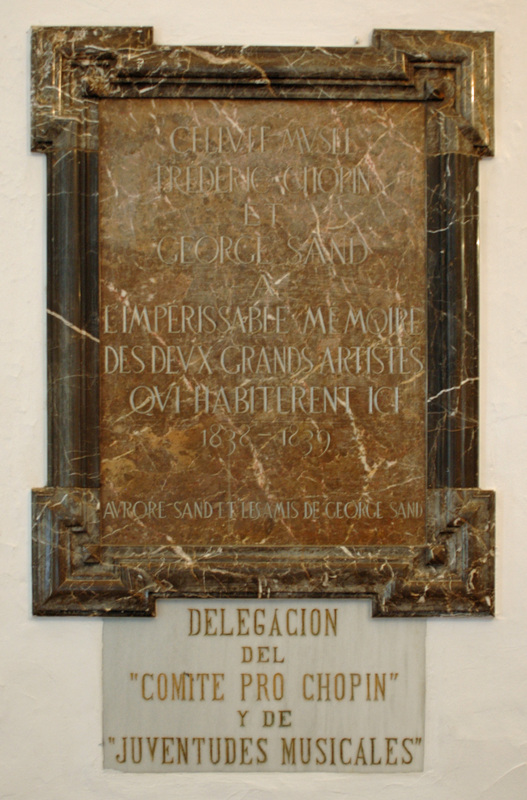 It is in these terms that George Sand, four years after his trip to the Balearic Islands, begins his story. 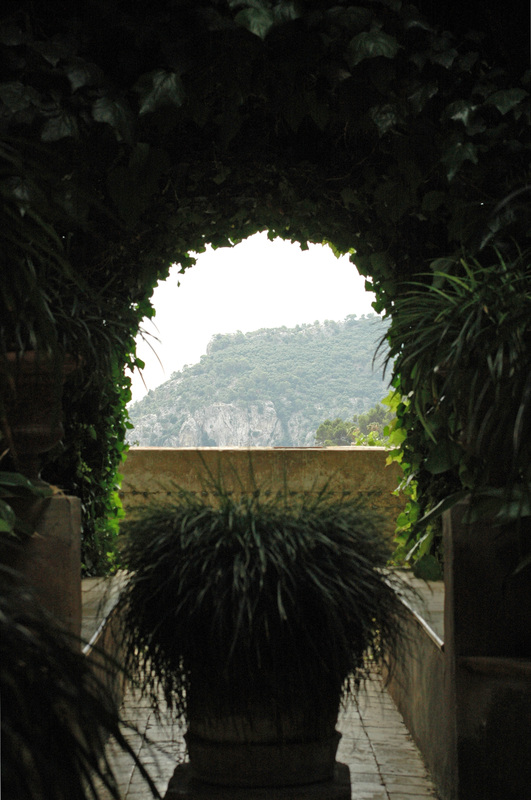 "All that the poet and the painter can dream, nature has created in this place." "But you, Eugene, my old friend, my dear artist, I wanted to take the night in the mountain when the moon lit the flood livid. " 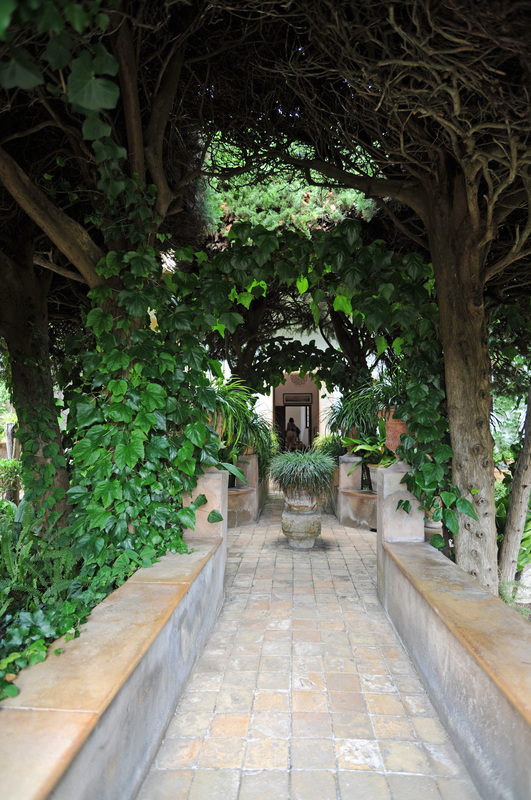 Intoxicated by the splendor of the island, George Sand will honor them repeatedly. She writes with passion, reliving his memories. "Here, flora bursting with majesty. Even in winter when 117,000 almond trees timidly Island hatch in late January, coating the campaign of a white and pink coat. 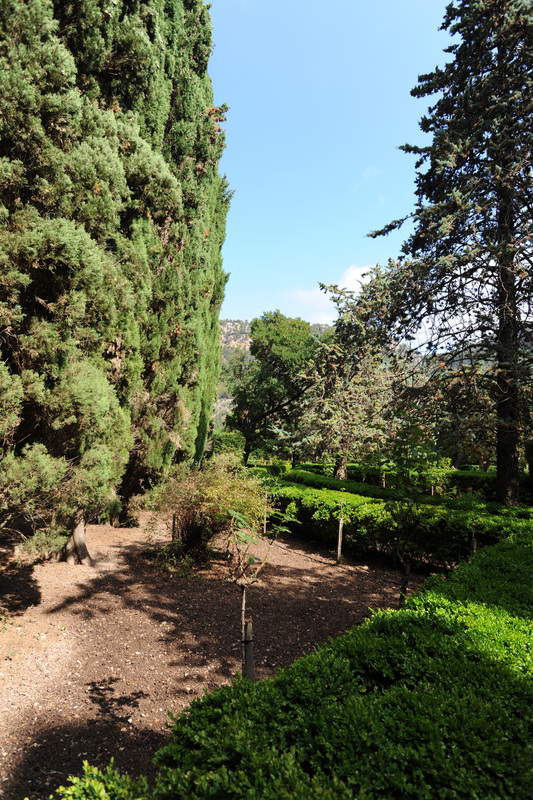 The colors of the leaves of carob, olive, green oak and cypress mingle in the guise of an invisible brush forming a "chasm of greenery". It then falls with delight, saying the blue sky and sea as divine promises. "" When the sight of mud and mist Paris throws me in the spleen, I close my eyes, and I see this as a dream green mountains, the wild rocks and this solitary palm lost in a pink sky. " 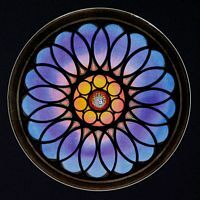 "[…] It was questionable whether the monastery was not a kind of purgatory, where Sand explored the underworld while the patient was already feeling up to Heaven." The monastery housed other figures such as, among others, Mr. Gaspar Jovellanos during his exile, Joseph Bonaventure Laurens, Rubén Darío, Sorolla, Azorin, Eugeni d’Ors, Unamuno or Borges. 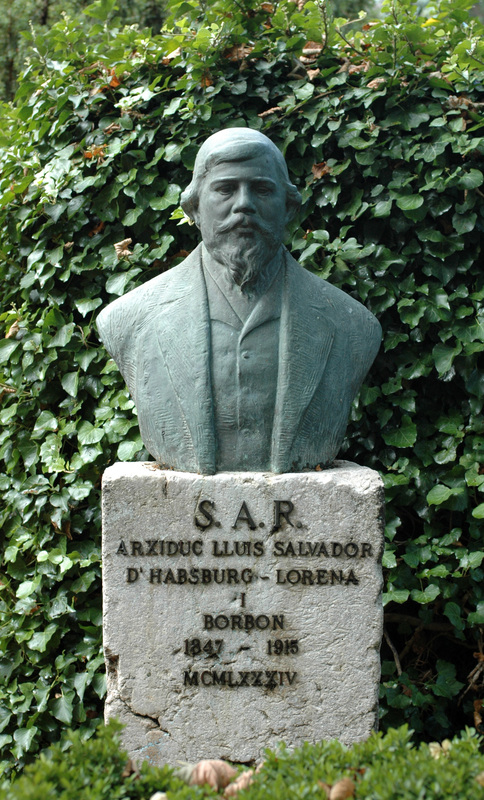 Later, the Nicaraguan poet Rubén Darío was the host family Sureda there Montaner domain owner of Chartreuse. To fight against his own nightmares Rubén Dario had the habit of sleeping in monk’s robes, but his drinking caused a rupture with private hosts and leaving the monastery and Majorca. 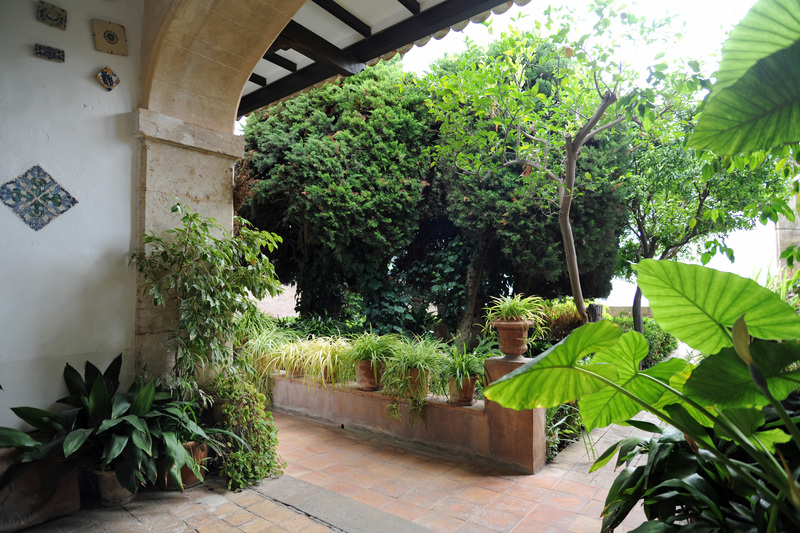 Every year in August, an international music festival held inside the cloister. 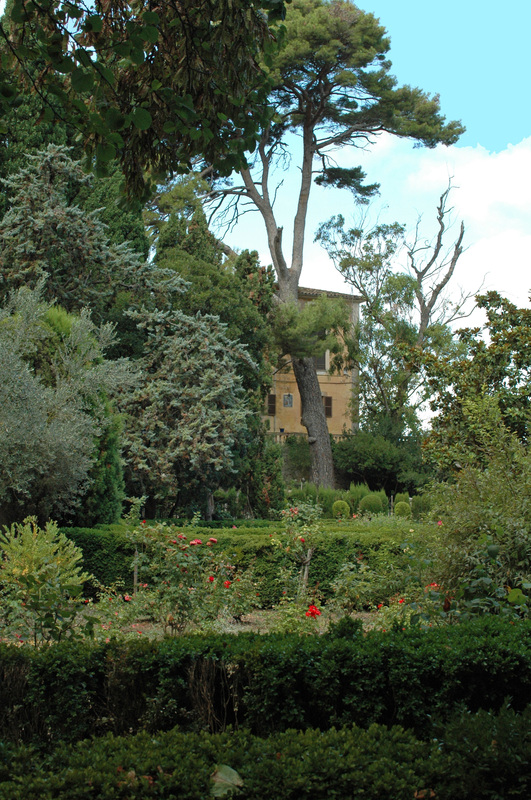 Great pianists are mainly performing works by Chopin… every Sunday at 22:00. See programming: www.festivalchopin.com. 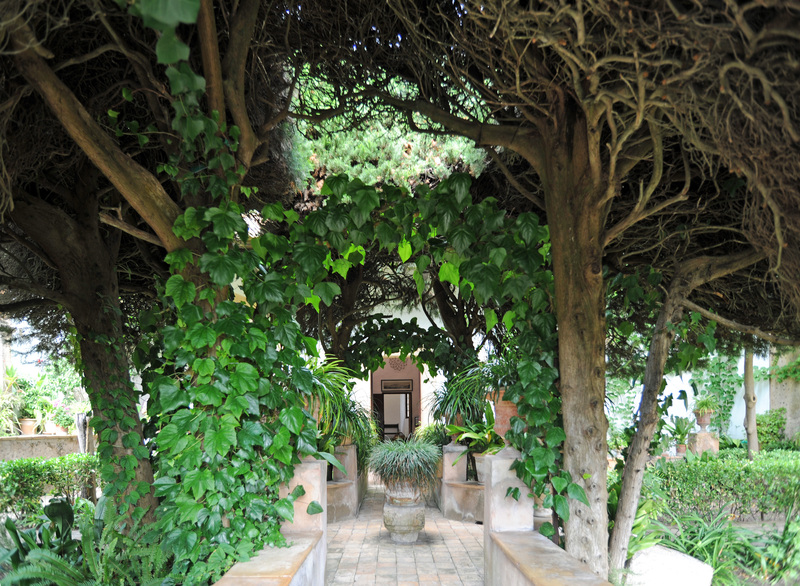 Summer hours (March to October): Monday to Saturday, from 9:30 to 18:30. Sunday, from 10:00 to 13:00. 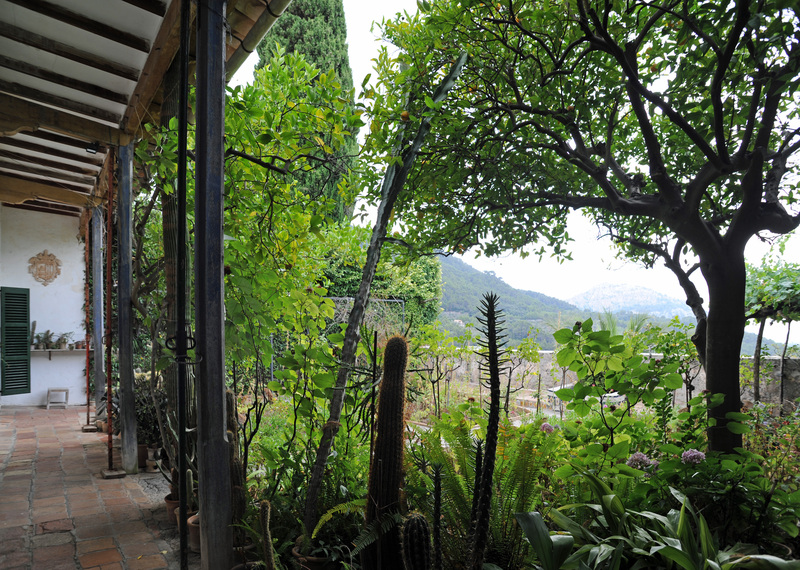 Winter hours (November to February): Monday to Saturday, from 9:30 to 16:30. Closed on Sundays. Price: € 7.50 for adults, € 3 for students and free for children under 10 years.